Neurons communicate through neurotransmitter release at specialized synaptic regions known as active zones (AZs). Using biosensors to visualize single synaptic vesicle fusion events at Drosophila neuromuscular junctions, we analyzed the developmental and molecular determinants of release probability (Pr) for a defined connection with ~300 AZs. Pr was heterogeneous but represented a stable feature of each AZ. Pr remained stable during high frequency stimulation and retained heterogeneity in mutants lacking the Ca2+ sensor Synaptotagmin 1. Pr correlated with both presynaptic Ca2+ channel abundance and Ca2+ influx at individual release sites. Pr heterogeneity also correlated with glutamate receptor abundance, with high Pr connections developing receptor subtype segregation. Intravital imaging throughout development revealed that AZs acquire high Pr during a multi-day maturation period, with Pr heterogeneity largely reflecting AZ age. The rate of synapse maturation was activity-dependent, as both increases and decreases in neuronal activity modulated glutamate receptor field size and segregation. To send a message to its neighbor, a neuron releases chemicals called neurotransmitters into the gap – or synapse – between them. The neurotransmitter molecules bind to proteins on the receiver neuron called receptors. But what causes the sender neuron to release neurotransmitter in the first place? The process starts when an electrical impulse called an action potential arrives at the sender cell. Its arrival causes channels in the membrane of the sender neuron to open, so that calcium ions flood into the cell. The calcium ions interact with packages of neurotransmitter molecules, known as synaptic vesicles. This causes some of the vesicles to empty their contents into the synapse. But this process is not particularly reliable. Only a small fraction of action potentials cause vesicles to fuse with the synaptic membrane. How likely this is to occur varies greatly between neurons, and even between synapses formed by the same neuron. Synapses that are likely to release neurotransmitter are said to be strong. They are good at passing messages from the sender neuron to the receiver. Synapses with a low probability of release are said to be weak. But what exactly differs between strong and weak synapses? Akbergenova et al. studied synapses between motor neurons and muscle cells in the fruit fly Drosophila. Each motor neuron forms several hundred synapses. Some of these synapses are 50 times more likely to release neurotransmitter than others. Using calcium imaging and genetics, Akbergenova et al. showed that sender cells at strong synapses have more calcium channels than sender cells at weak synapses. The subtypes and arrangement of receptor proteins also differ between the receiver neurons of strong versus weak synapses. Finally, studies in larvae revealed that newly formed synapses all start out weak and then gradually become stronger. How fast this strengthening occurs depends on how active the neuron at the synapse is. This study has shown, in unprecedented detail, key molecular factors that make some fruit fly synapses more likely to release neurotransmitter than others. Many proteins at synapses of mammals resemble those at fruit fly synapses. This means that similar factors may also explain differences in synaptic strength in the mammalian brain. Changes in the strength of synapses underlie the ability to learn. Furthermore, many neurological and psychiatric disorders result from disruption of synapses. Understanding the molecular basis of synapses will thus provide clues to the origins of certain brain diseases. Synaptic vesicle fusion occurs at specialized regions of the presynaptic membrane known as active zones (AZs). Several evolutionarily conserved structural proteins are enriched in this subdomain of the presynaptic terminal, including RIM, RIM binding protein, Syd-1, Liprin-α, ELKS/CAST/Bruchpilot, Munc13, and Bassoon/Piccolo/Fife (Schoch and Gundelfinger, 2006; Südhof, 2012; Van Vactor and Sigrist, 2017; Zhai and Bellen, 2004). These large macromolecular complexes facilitate clustering of synaptic vesicles and voltage-gated Ca2+ channels (VGCCs), allowing action potential-triggered Ca2+ influx to act locally on synaptic vesicles that are docked and primed for release (Acuna et al., 2016; Zito et al., 1999; Bucurenciu et al., 2008; Eggermann et al., 2011; Fouquet et al., 2009; Kawasaki et al., 2004). Synaptic vesicle fusion occurs through a highly probabilistic process, often with only a small percent of action potentials triggering release from individual AZs (Körber and Kuner, 2016). Although AZs largely share the same complement of proteins, release probability (Pr) for synaptic vesicle fusion is highly variable across different neurons and between AZs formed by the same neuron (Atwood and Karunanithi, 2002; Branco and Staras, 2009; Melom et al., 2013; Peled and Isacoff, 2011). Studies have demonstrated that Ca2+ channel abundance and Ca2+ influx are key determinants of Pr (Borst and Sakmann, 1996; Chen et al., 2015; Meinrenken et al., 2002Zito et al., 1999; Nakamura et al., 2015; Sheng et al., 2012; Wang et al., 2008). In addition, some AZ-specific proteins are non-uniformly distributed, and the molecular composition of AZs can undergo rapid changes (Glebov et al., 2017; Graf et al., 2009; Liu et al., 2016; Reddy-Alla et al., 2017; Sugie et al., 2015; Tang et al., 2016; Weyhersmüller et al., 2011; Wojtowicz et al., 1994). The Drosophila neuromuscular junction (NMJ) has emerged as a useful system to study release heterogeneity. At this connection, motor neurons form glutamatergic synapses onto bodywall muscles in a stereotypical fashion, with the axon expanding to form ~10–60 synaptic boutons that each contain many individual AZs (Harris and Littleton, 2015). Drosophila AZs contain a similar assortment of proteins to those identified at mammalian AZs (Böhme et al., 2016; Bruckner et al., 2017, 2012; Ehmann et al., 2014; Feeney et al., 1998; Fouquet et al., 2009; Graf et al., 2012; Jan and Jan, 1976; Kaufmann et al., 2002; Kittel et al., 2006; Liu et al., 2011; Owald et al., 2010; Wagh et al., 2006). Each AZ is specifically associated with a postsynaptic glutamate receptor field. Glutamate receptors at the Drosophila NMJ are excitatory inotropic non-NMDA receptors that exist as tetramers, with three obligatory subunits encoded by GluRIII, GluRIID and GluRIIE, and a variable fourth subunit encoded by either GluRIIA (A-type) or GluRIIB (B-type) (Featherstone et al., 2005; Marrus et al., 2004; Petersen et al., 1997; Qin et al., 2005; Schuster et al., 1991). GluRIIA containing receptors generate a larger quantal size and display slower receptor desensitization than their GluRIIB counterparts (DiAntonio et al., 1999). The A- and B-subtypes compete for incorporation into the tetramer at individual postsynaptic densities (PSDs) in a developmental and activity-regulated fashion (Chen and Featherstone, 2005; DiAntonio et al., 1999; Marrus and DiAntonio, 2004a; Rasse et al., 2005; Schmid et al., 2008). The stereotypical alignment of individual AZs to distinct postsynaptic glutamate receptor fields in Drosophila allowed the generation of genetic tools to optically follow quantal fusion events at single release sites by visualizing glutamate receptor activation (Melom et al., 2013; Peled and Isacoff, 2011). Classically, studies of synaptic transmission have used electrophysiology to measure the postsynaptic effect of neurotransmitter release over a population of release sites (Katz and Miledi, 1969, 1967), precluding an analysis of how individual AZs contribute to the evoked response. By transgenically expressing GCaMP Ca2+ sensors that target to the postsynaptic membrane, single vesicle fusion events at each individual AZ can be imaged by following spatially localized Ca2+ influx induced upon glutamate receptor opening. This allows for the generation of Pr maps for both evoked and spontaneous fusion for all AZs (Cho et al., 2015; Melom et al., 2013; Muhammad et al., 2015; Newman et al., 2017; Peled et al., 2014; Peled and Isacoff, 2011; Reddy-Alla et al., 2017). One surprising observation using this quantal imaging approach is that AZs formed by a single motor neuron have a heterogeneous distribution of Pr, ranging from 0.01 to ~0.5, with neighboring AZs often showing ~50-fold differences in Pr (Melom et al., 2013; Peled et al., 2014; Peled and Isacoff, 2011). These differences in Pr result in AZs with distinct short-term plasticity properties, suggesting release heterogeneity has functional importance for synaptic transmission (Peled and Isacoff, 2011). Key questions raised by these observations include how Pr is uniquely set for individual AZs and how the heterogeneity in Pr arises during development. Pr variability is likely to be controlled in part by variable Ca2+ channel abundance at release sites, consistent with the heterogeneity in VGCCs and other associated AZ proteins previously documented (Böhme et al., 2016; Ehmann et al., 2014; Fulterer et al., 2018; Graf et al., 2012, 2009; Guerrero et al., 2005; Peled and Isacoff, 2011). Indeed, Pr has been shown to correlate with BRP abundance at AZs in Drosophila (Paul et al., 2015; Peled et al., 2014; Reddy-Alla et al., 2017) and BRP has a key function in clustering VGCCs (Kittel et al., 2006). Furthermore, Pr has previously been shown to correlate with the number of VGCCs at several vertebrate synapses (Chen et al., 2015; Nakamura et al., 2015; Sheng et al., 2012). Pr could also be regulated by local synaptic vesicle pools and their number and/or state (i.e. phosphorylation status). Beyond the molecular factors that determine AZ Pr, it is unclear how release heterogeneity at Drosophila NMJs arises during development. Intravital imaging at third instar larval NMJs has demonstrated that AZs are born small and gain pre- and postsynaptic components over time in a sequential manner (Andlauer and Sigrist, 2012; Fouquet et al., 2009; Füger et al., 2007; Rasse et al., 2005; Zhang et al., 2010). However, this approach has not been used during earlier stages of larval development to determine whether the release heterogeneity observed at third instar NMJs reflects AZ birth order. To characterize factors regulating Pr at individual AZs, as well as the origin of Pr diversity, we employed optical quantal analysis and intravital imaging to examine how Pr heterogeneity arises during development. Recent studies indicate that release sites possess structural and functional heterogeneity (Éltes et al., 2017; Holderith et al., 2012; Maschi and Klyachko, 2017; Melom et al., 2013; Peled et al., 2014; Peled and Isacoff, 2011; Reddy-Alla et al., 2017; Sugie et al., 2015). Using the Drosophila NMJ, we previously observed that evoked Pr is non-uniform across a population of ~300 AZs formed by motor neuron MN4-Ib onto muscle 4, ranging from 0.01 to ~0.5 in HL3 saline containing 1.3 mM extracellular Ca2+ and 20 mM Mg2+ (Melom et al., 2013). In our original study, each AZ was identified by the location of postsynaptic Ca2+ flashes, but AZs were not directly labeled in the live preparation. To more precisely map AZ Pr heterogeneity, we identified the position of each corresponding PSD by co-expressing the RFP-tagged glutamate receptor subunit GluRIIA under the control of its endogenous promoter (Rasse et al., 2005) along with a newer version of our previous biosensor, N-terminal myristoylated GCaMP6s, expressed in muscles using Mef2-GAL4. We monitored postsynaptic Ca2+ influx from activation of glutamate receptors after either spontaneous release or nerve stimulation (0.3 Hz for 5 min) in muscle 4 of early stage third instar larvae (Video 1). Representative movie showing evoked and spontaneous GCaMP6s events (green) in larvae expressing GluRIIA-RFP (red) that were stimulated at 0.3 Hz. Using this approach, we mapped all myrGCaMP6s visualized release events to the position of in vivo GluRIIA-RFP labeled PSDs (Figure 1A). Consistent with previous data, we observed a heterogeneous distribution of AZ Pr, with an average Pr of 0.073 ± 0.002 (n = 1933 AZs from 16 NMJs from 16 animals). However, there was a ~50-fold difference in Pr between the highest and lowest releasing sites. The AZ Pr dataset did not fit a normal distribution (D'Agostino K2 test (p<0.0001), Shapiro-Wilk test (p<0.0001), Kolmogorov-Smirnov test (p<0.0001)) and instead was skewed to the right, with a majority of AZs rarely releasing a synaptic vesicle following an action potential (Pr in the range of 0.01 to 0.2) and a small number of AZs consistently showing high release rates (75% percentile of Pr was 0.1, with a maximum Pr of 0.73; Figure 1B). 9.7% of all release sites defined by their apposed GluRIIA receptors displayed only spontaneous fusion events, and another 14.6% of the AZ population was silent for both spontaneous and evoked release during the recording period (Figure 1B). We categorized all AZs with a release rate greater than two standard deviations above average as ‘high Pr’, and the remaining AZs that showed evoked release as ‘low Pr’. Using these criteria, 65.8% of all AZs fell in the low Pr category with an average Pr of 0.049 ± 0.004. In contrast, 9.9% of AZs were classified as high Pr sites, with an average Pr of 0.277 ± 0.015 (Figure 1C). High Pr AZs displayed on average a 5.7-fold higher chance of vesicle fusion following an action potential compared to low Pr AZs. High Pr sites correspond to single AZs with elevated levels of BRP. (A) Representative images of consecutive evoked release events (green flashes) visualized by expressing myrGCaMP6s in muscle 4. The position of each AZ was determined by expressing GluRIIA-RFP to label the corresponding PSD. Evoked release triggers fusion across different sets of AZs during each stimulus, but a subpopulation of AZs respond more frequently (arrow). (B) Histogram of the distribution of AZ Pr for a 0.3 Hz 5 min stimulation paradigm. AZs classified as high Pr (>2 standard deviations above the mean) are shown in red. The percentage of AZs that were low Pr (65.8%), high Pr (9.9%), spontaneous-only (9.7%) and silent (14.6%) is displayed in the inset. (C) Average Pr determined for each individual experiment for the AZ population categorized based on low and high activity sites (>2 standard deviations above the mean). Each point represents the average for all AZs (classified as either high or low Pr) from a single animal. (D) Individual BRP puncta for three NMJs from three different animals imaged with high resolution structured illumination microscopy (SIM, left panel) or confocal microscopy (middle panel). The right panel displays the heat map for evoked Pr from the same NMJs determined by GCaMP6s imaging prior to fixation. 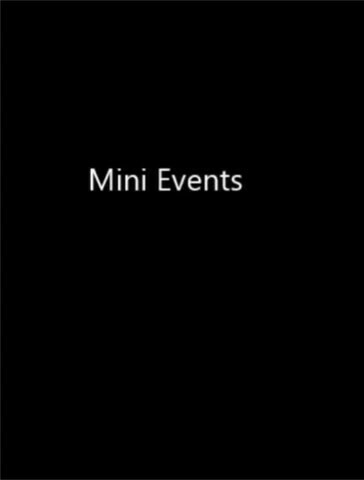 Representative high Pr sites are circled with red in the middle panels. Representative example of a large BRP puncta that would be classified as a single AZ using conventional light microscopy but resolved into multiple clustered AZs using SIM analysis is boxed with the dotted white line. The far right top panel displays the results from the automated detection algorithm that outlines individual AZs. (E) AZs were separated into high and low Pr based on their activity and the sum fluorescence intensity of the corresponding BRP puncta is shown. (F) AZs with high BRP intensity (two standard deviations above average) were preselected from conventional confocal images and identified on corresponding SIM images. 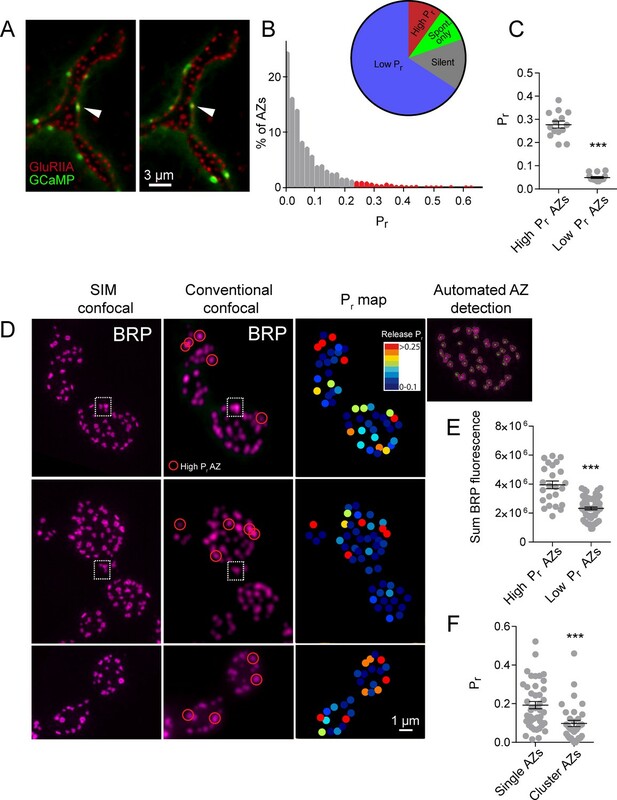 In cases where the BRP signal was resolvable into more than one AZ by SIM microscopy, it was assigned to the AZ cluster group. In cases where the BRP signal mapped to a single BRP puncta by SIM imaging, it was assigned to the single AZ group. Pr is plotted for each group. Student’s t-test was used for statistical analysis (***=p ≤ 0.001). Error bars represent SEM. One potential caveat to the interpretation of Pr heterogeneity is the possibility that multiple closely-positioned release sites could be falsely characterized as single high Pr AZs using conventional light microscopy. Presynaptic AZ position can be precisely identified at the NMJ by labeling the core AZ T-bar component Bruchpilot (BRP), the homolog of mammalian ELKS/CAST (Fouquet et al., 2009; Wagh et al., 2006). To determine if the high Pr sites we observed were actually due to release from closely clustered AZs, we used high-resolution structured illumination microscopy (SIM) on fixed tissue stained with anti-BRP (Figure 1D) following dual color (myrGCaMP6s/GluRIIA-RFP) quantal imaging. SIM provides a lateral resolution of ~110 nm (Wegel et al., 2016), providing clear resolution of the BRP ring structure, which has a diameter of ~200 nm (Owald et al., 2012), smaller than the resolution limit of conventional light microscopy. The presence of GluRIIA-RFP allowed us to precisely match individual high Pr sites observed during live imaging with their position in fixed and stained tissue during SIM imaging (Figure 1D). Using an automated detection algorithm in the Volocity 3D image analysis software, we were able to identify all AZs labeled with BRP (Figure 1D, far right panel), and to resolve individual AZ clusters that were not separated using conventional spinning disk microscopy (Figure 1D, white box). SIM analysis of distances between neighboring AZs indicated that 2.45 ± 0.4% (n = 9 NMJs from nine animals) of all AZs were located close enough to each other (within 280 nm) such that they would not be resolvable during live imaging. In contrast, 9.9% (n = 16 NMJs from 16 animals) of AZs were functionally classified as high Pr sites, suggesting that the majority of these sites are not likely to be explained by release from multiple closely clustered AZs. SIM visualization of BRP at AZs following Pr mapping revealed that a majority of high Pr sites were represented by a single BRP-positive AZ that was not further resolvable after SIM (Figure 1D, red circles). We identified high Pr sites (n = 42 AZs from 5 NMJs from five animals) and then determined what fraction of these sites were truly clusters of multiple neighboring AZs based on their SIM profiles. Only 16 ± 3% of these high Pr sites were resolved into multiple AZs upon SIM analysis, indicating that most high Pr AZs correspond to single release sites. These single BRP clusters at high Pr sites had larger sum fluorescence intensities than most other BRP positive puncta (Figure 1E). The average sum fluorescence of single BRP puncta from high Pr AZs (3.95 × 106 ± 2.67 x 105, n = 24 AZs from 9 NMJs from nine animals) was 1.7-fold greater than the fluorescence of randomly selected low Pr BRP clusters (2.33 × 106 ± 0.98 x 105, n = 60 AZs from 9 NMJs from nine animals, p<0.0001). To further examine large single BRP clusters that could not be resolved using conventional spinning disk microscopy, all BRP clusters larger than 280 nm were automatically detected and assigned their Pr measured during live imaging. We then determined whether these sites were represented by single or multiple AZs using SIM microscopy. Clusters > 280 nm in diameter that could be resolved to multiple BRP positive AZs after SIM imaging had a lower Pr (0.10 ± 0.02, n = 35 AZs from 5 NMJs from five animals) than those comprised of a single large BRP positive AZ (0.19 ± 0.02, n = 42 AZs from 5 NMJs from five animals; Figure 1F). As such, high resolution SIM analysis confirms that most high Pr sites correspond to single AZs with more intense BRP labeling, consistent with previous data supporting the positive role of BRP in regulating Pr (Paul et al., 2015; Peled et al., 2014; Reddy-Alla et al., 2017). Heterogeneous release rates between AZs could solely reflect stable differences in protein content of the AZs themselves. However, the accumulation of different synaptic vesicle populations with variable levels of Ca2+ sensitivity or fusogenicity might also contribute to release heterogeneity. The synchronous Ca2+ sensor Synaptotagmin 1 (Syt1) resides on synaptic vesicles and plays a major role in Pr determination at Drosophila NMJs (DiAntonio and Schwarz, 1994; Guan et al., 2017; Lee et al., 2013; Littleton et al., 1994, 1993; Yoshihara et al., 2003; Yoshihara and Littleton, 2002). We hypothesized that if differential synaptic vesicle Ca2+ sensitivity is a major determinant of release heterogeneity in addition to its established role in determining overall Pr, then elimination of Syt1 would disrupt Pr heterogeneity. Consistent with electrophysiological findings, quantal imaging in syt1 null mutants expressing GluRIIA-RFP and myrGCaMP6s revealed a dramatic reduction in evoked release, a shift from synchronous to highly asynchronous fusion, and an increase in spontaneous release rates (Video 2). To estimate AZ release heterogeneity in syt1 nulls, preparations were stimulated at 5 Hz and release events were normalized to the number of stimuli (Figure 2A). The average release rate per AZ per second in syt1 nulls during 5 Hz stimulation was 0.03 ± 0.001 (n = 719 AZs from 7 NMJs from six animals; Figure 2B). In contrast, spontaneous release rate per AZ in the absence of stimulation was 0.018 ± 0.001 per second in syt1 nulls (n = 719 AZs from 7 NMJs from six animals) compared to 0.011 ± 0.001 in controls (n = 559 AZs from 6 NMJs from four animals, p<0.0001; Figure 2B). Pr variability remains in syt1 null mutants. (A) The left panel displays the distribution of GluRIIA in syt1 nulls (left panel) at the muscle 4 NMJ. The corresponding Pr heatmap is shown on the right. The arrows denote several high Pr sites opposed by bright GluRIIA positive PSDs. (B) AZ release events per second for spontaneous release and evoked by 5 Hz stimulation are shown for syt1 nulls mutants, and for spontaneous release in controls. (C) Frequency distribution of Pr is shown for syt1 nulls and controls. (D) Plot of normalized Pr frequency distribution (from 0 to 1 (max)) for syt1 nulls and controls. (E) Cumulative frequency distribution for normalized release rates for syt1 nulls and controls is shown. One-way ANOVA followed by Dunnett’s multiple comparisons test used for statistical analysis (***=p ≤ 0.001). Error bars represent SEM. Representative movie showing spontaneous GCaMP6s events in syt1 mutants expressing GluRIIA-RFP (red), followed by GCaMP6s events observed during 5 Hz stimulation. Although release rate is dramatically reduced in syt1 nulls, AZs still maintained overall heterogeneity in Pr distribution. Comparing the distribution of AZ release rates for syt1 nulls and controls, release was proportionally decreased across all AZs in syt1 (Figure 2C); frequency distribution analysis of AZs with normalized release rates (from 0 to maximum release) confirmed that there was no significant change in the heterogeneity of release between syt1 mutants and controls (Figure 2D,E). Given that AZ Pr remains highly heterogeneous in the absence of Syt1, these data indicate that heterogeneity in synaptic vesicle Ca2+ sensitivity between AZs is unlikely to play a major role in Pr distribution. 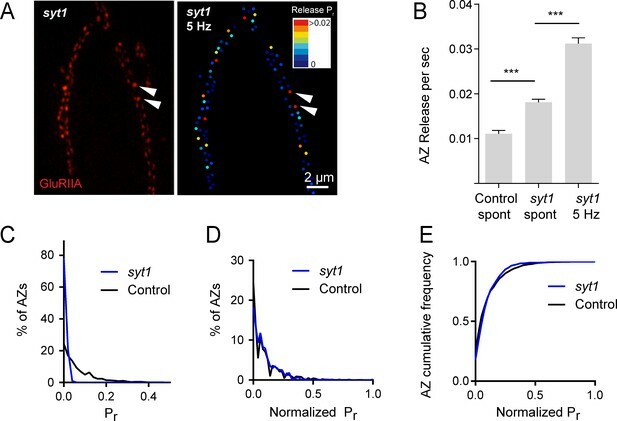 Release heterogeneity in syt1 null animals suggests that synaptic vesicle Ca2+ sensitivity is not a major determinant of Pr heterogeneity at this synapse; however, it is possible that other synaptic vesicle components influence Pr on an AZ-specific level. If unique local synaptic vesicle pools contribute to the distribution of Pr between AZs, we predicted that Pr would be highly dynamic at individual AZs over time. In contrast, stability of Pr would argue that release heterogeneity is more likely associated with stably resident proteins at individual AZs. To assess Pr stability over time, we conducted a 3 min imaging session using 0.3 Hz stimulation to generate an initial Pr map, and then allowed the preparation to rest for 5 min without stimulation or imaging before re-mapping Pr in a final 3 min imaging session. We were constrained in our ability to examine Pr continuously over longer time intervals due to bleaching of GCaMP6s from the high frequency capture rate. Pr at individual AZs was very stable between the two sessions (Figure 3A). This was especially evident for high Pr sites, which sustained high levels of activity during both imaging sessions. Plotting release rate for all AZs revealed a strong correlation for Pr across the two imaging sessions (Pearson r = 0.77, R2 = 0.59, p<0.0001, n = 988 AZs from 8 NMJs from seven animals; Figure 3B). Stability of release maps at the NMJ. (A) Pr heatmaps for the same muscle 4 NMJ were generated for two individual imaging sessions, separated by a 5 min resting period. High Pr AZs were numbered and re-identified in each heatmap. Representative high Pr AZs that sustain release rates during the second imaging session are noted with arrows. (B) Correlation of AZ Pr between two imaging sessions separated by a 5 min resting period. (C) Pr heatmaps for the same NMJ separated by a 5 min 5 Hz stimulation. Representative high Pr AZs that did not change activity levels are noted with arrows. (D) Correlation of AZ Pr between two imaging sessions separated by a 5 min 5 Hz stimulation period. We next used a strong stimulation paradigm to drive vesicle cycling to promote intermixing of synaptic vesicles. NMJ preparations were imaged during two low frequency 0.3 Hz stimulation periods separated by a 5 min 5 Hz stimulation session (Figure 3C). Release maps were not dramatically altered by 5 Hz stimulation, with the overall correlation of Pr between the two imaging sessions similar with and without stimulation (Pearson r = 0.78, R2 = 0.61, p<0.0001, n = 613 AZs from 6 NMJs from six animals; Figure 3D). Thus, inducing vesicle recycling with 5 Hz stimulation does not dramatically change Pr across the AZ population, arguing that stably resident AZ components, rather than AZ-specific synaptic vesicle populations, are likely to represent the major driver of Pr heterogeneity at this synapse. Given that vesicle fusion is highly sensitive to Ca2+ and most effective in close proximity to VGCCs (Augustine et al., 1985; Böhme et al., 2016; Chen et al., 2015; Heidelberger et al., 1994; Katz and Miledi, 1967; Katz, 1969Zito et al., 1999; Keller et al., 2015; Meinrenken et al., 2003, 2002; Nakamura et al., 2015; Sheng et al., 2012; Stanley, 2016; Wang et al., 2008), Ca2+ channel abundance at individual AZs is predicted to be a key variable for Pr heterogeneity at Drosophila NMJs as well. Cacophony (cac) encodes the Drosophila voltage-activated Ca2+ channel α1 subunit required for neurotransmitter release (Fouquet et al., 2009; Kawasaki et al., 2004; 2000; Littleton and Ganetzky, 2000; Liu et al., 2011; Rieckhof et al., 2003; Smith et al., 1996). Transgenic animals expressing fluorescently tagged Cac channels have been previously generated, demonstrating that Cac localizes specifically to AZs and its abundance appears heterogenous across release sites (Kawasaki et al., 2004; Matkovic et al., 2013; Yu et al., 2011). To examine the heterogeneity of Cac abundance across AZs, we used SIM to measure the distribution of Cac-GFP and BRP at muscle 4 NMJs. Using this approach, we observed a heterogeneous distribution of mean Cac-GFP fluorescence at AZs, similar to the variable levels of BRP intensity described earlier (Figure 1D, Figure 4—figure supplement 1A,B). 5.72% of AZs displayed Cac-GFP fluorescence greater than two standard deviations above average (n = 2011 AZs from 11 NMJs from three animals). The mean Cac-GFP fluorescence for these bright AZs was 2.1-fold greater than that observed for the remaining sites (p<0.0001; Figure 4—figure supplement 1C). Mean AZ intensities of Cac-GFP and BRP were positively correlated (Pearson r = 0.46, R2 = 0.21, p<0.0001, n = 730 AZs from 6 NMJs from three animals; Figure 4—figure supplement 1D,E). To determine whether Cac distribution correlates with Pr heterogeneity, we used dual color imaging experiments where vesicle fusion events were detected by myrGCaMP6s driven in muscles using mef2-GAL4 and Ca2+ channel distribution was visualized using red-labeled Cac-TdTomato expressed pan-neuronally using elav-GAL4 (Figure 4A). We observed a strong positive correlation (average Pearson r = 0.61, R2 = 0.38, p<0.0001, n = 483 AZs from 7 NMJs from seven animals) between AZ Cac fluorescence intensity and evoked AZ Pr (Figure 4B). In contrast, single AZ release rates for spontaneous events showed only a mild correlation with Cac intensity (average Pearson r = 0.19, R2 = 0.036, p<0.0001, n = 483 AZs from 7 NMJs from seven animals; Figure 4C). These results are consistent with previous observations that release rates for evoked and spontaneous fusion are not correlated at Drosophila AZs (Melom et al., 2013; Peled et al., 2014), and that spontaneous fusion is largely independent of extracellular Ca2+ at this synapse (Jorquera et al., 2012; Lee et al., 2013). Pr correlates with Cac channel abundance at AZs. (A) Representative images showing heterogeneous distribution of Cac-TdTomato at the NMJ of muscle 4 (left panel). Evoked release was visualized at the same NMJ using myrGCaMP6s (second panel) and AZ release maps were generated for evoked (third panel) and spontaneous fusion (right panel). Several high Pr AZs with bright Cac density are noted (arrows). (B) Correlation between AZ Pr and Cac-TdTomato fluorescence intensity. (C). Correlation between AZ spontaneous release rate per second and Cac-TdTomato fluorescence intensity. 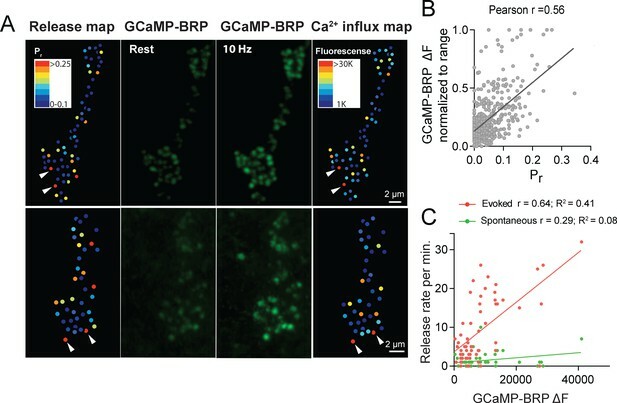 (D) Representative images showing heterogeneous distribution of Cac-GFP at the NMJ (left panel). Evoked release visualized at the same NMJ by myr-jRGECO1a is shown in the second panel. The Pr heatmap for evoked release is shown in the third panel. A heatmap distribution of Cac-GFP fluorescence intensities, based on same two standard deviation criteria as color-coding of Pr, is shown in the right panel. The arrows denote several higher Pr sites that correlated with bright Cac-GFP puncta. (E) Correlation between AZ Pr and Cac-GFP fluorescence intensity for evoked release. (F) Cac-GFP fluorescence for AZs functionally classified as either low or high Pr (>2 standard deviations above mean) by quantal imaging with myr-jRGECO1a. Student’s t-test was used for statistical analysis (***=p ≤ 0.001). Error bars represent SEM. To increase confidence that the observed Cac-TdTomato intensity accurately reflects Cac distribution, we also measured the correlation between Pr and Cac channels transgenically tagged with GFP. We generated transgenic lines expressing myristoylated red Ca2+ indicators previously characterized in the field, including RCaMP1h, R-GECO1 and jRGECO1a. Although RCaMP1h and R-GECO1 were too dim to visualize localized Ca2+ transients at PSDs, transgenic lines expressing the myristoylated Ca2+ sensor jRGECO1a (Dana et al., 2016) in muscle four allowed detection of Ca2+ influx following vesicle fusion at single AZs (Video 3). In contrast to the more robust GCaMP6s, jRGECO1a has a shorter fluorescent lifetime and the signal amplitude decays more rapidly. We observed that quantal events imaged with myr-jRGECO1a were dimmer and fully bleached within 7–10 min of imaging. Therefore, preparations were stimulated at 1 Hz for shorter two-minute imaging sessions to generate Pr maps in larvae expressing myr-jRGECO1a (Figure 4D). We observed a strong correlation between AZ Pr detected by myr-jRGECO1a and Cac-GFP intensity (average Pearson r = 0.54, R2 = 0.29, p<0.0001, n = 651 AZs from 7 NMJs from seven animals, correlation from a representative experiment shown in Figure 4E). Again, we found a weaker correlation between spontaneous fusion and Cac-GFP intensity (Pearson r = 0.17, R2 = 0.03, p<0.0001, n = 651 AZs from 6 NMJs from six animals). Hence, Pr for action-potential evoked fusion is strongly correlated with the local abundance of Cac channels at individual Drosophila AZs. 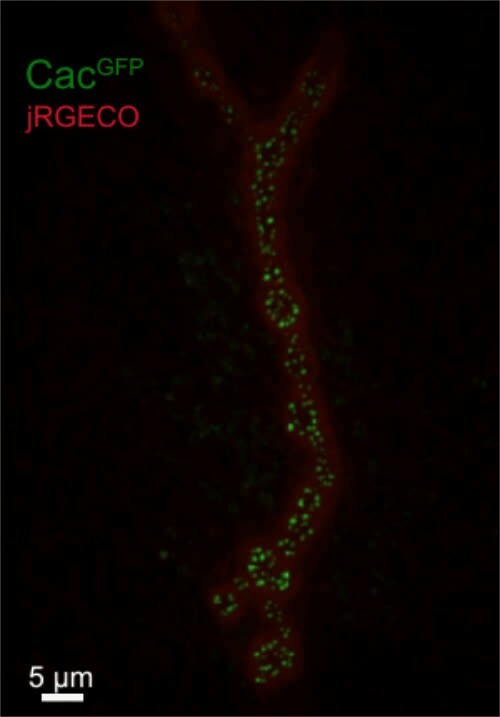 Representative movie showing evoked and spontaneous jRGECO events (red) in larvae expressing Cac-GFP (green). We next compared Cac-GFP fluorescence at AZs that were functionally classified as either low or high Pr sites by quantal imaging using myr-jRGECO1a (Figure 4F). The average fluorescence of single Cac-GFP puncta from high Pr AZs (normalized intensity = 0.6 ± 0.04, n = 38 AZs from 7 NMJs from seven animals) was 2.09-fold greater than the average fluorescence of low Pr AZs (normalized intensity = 0.29 ± 0.01, n = 638 AZs from 7 NMJs from seven animals, p<0.0001). We also examined the Pr of AZs classified by Cac-GFP fluorescence. The average Pr for AZs displaying high Cac-GFP fluorescence (>2 standard deviations above average) was 0.2 ± 0.016 (n = 7 NMJs from seven animals) compared to 0.06 ± 0.003 (n = 7 NMJs from seven animals, p<0.0001) for the remaining AZs with lower levels of Cac-GFP. Although the absolute number of Cac channels at single Drosophila AZs is unknown, these data suggest that a ≥ 2 fold difference in channel number exists between low and high Pr AZs. Given the steep third to fourth order non-linear dependence of synaptic vesicle fusion on Ca2+ (Dodge and Rahamimoff, 1967; Heidelberger et al., 1994; Jan and Jan, 1976), a small change in channel number is likely to have a large effect on Pr. VGCCs are extensively modulated by second messenger pathways that can alter channel conductivity (Catterall and Few, 2008; Dolphin et al., 1991; Evans and Zamponi, 2006; Reid et al., 2003; Tedford and Zamponi, 2006; Zamponi and Snutch, 1998). Although Cac channel abundance correlates with AZ Pr, an important readout of channel activity is the local Ca2+ influx occurring at each AZ. Assaying presynaptic Ca2+ influx directly would also be useful to bypass any unknown effects on Pr generated by expressing fluorescently tagged Ca2+ channels. As such, we generated transgenic animals expressing GCaMP6m fused to the N-terminus of BRP, which localizes directly to the base of the AZ where Ca2+ channels cluster (Fouquet et al., 2009; Kittel et al., 2006). These GCaMP6m fusions were made to a BRP fragment (BRPshort) corresponding to amino acids 473–1226 of the full 1740 amino acid protein (Schmid et al., 2008). At rest, N-terminal GCaMP-BRPshort was dim, consistent with low levels of resting Ca2+ (Figure 5A). Stimulation at 10 Hz resulted in a robust increase in discrete punctated presynaptic fluorescence that remained confined to single AZs during stimulation (Figure 5A). During multiple rounds of 5 s 10 Hz stimulation, GCaMP-BRPshort fluorescence increase (ΔF) varied between AZs, but was stable at the same AZ for each independent stimulation (n = 205 AZs from 6 NMJs from three animals; Figure 5B,C). GCaMP-BRP detects relative Ca2+ influx at single AZs and is correlated with Cac channel abundance. (A) Representative images of the same muscle 4 NMJ bouton showing CCaMP6m-BRP fluorescence at rest and following 10 Hz stimulation for two consecutive rounds. (B) The AZ fluorescence intensity was plotted for three independent rounds of stimulation for BRP-GCaMP6m. Fluorescence changes per AZ remain stable for the same AZ during multiple rounds of stimulation. (C) Histogram of the distribution of relative fluorescence intensities (ΔF) across AZs for BRP-GCaMP6m. (D) Representative images showing GCaMP6m-BRP fluorescence before (left panel) and during stimulation (middle panel). The corresponding distribution of Cac channels labeled by Cac-TdTomato is shown for the same NMJ (right panel). Examples of rare Cac-positive AZs that showed no corresponding Ca2+ influx are indicated (arrows). (E) Correlation between GCaMP6m-BRP ΔF during stimulation and Cac-TdTomato fluorescence intensity at individual AZs. Given that GCaMP-BRPshort abundance at an AZ likely reflects the absolute amount of BRP at that AZ, we assayed if heterogeneity in GCaMP-BRPshort fluorescence during 10 Hz stimulation could be solely explained by differences in sensor distribution across AZs. We applied 200 nM of the Ca2+ ionophore ionomycin to elevate Ca2+ concentrations uniformly throughout the terminal independent of Cac abundance. In the presence of ionomycin, differences in fluorescent signals between AZs should be entirely due to heterogeneity in sensor abundance. We observed a rightward shift in the GCaMP-BRPshort intensity distribution among AZs upon ionomycin application compared to 10 Hz stimulation (average AZ fluorescence during 10 Hz stimulation was 1924 ± 63, and following ionomycin addition was 6105 ± 175; Figure 5—figure supplement 1A,B), indicating that during 10 Hz stimulation, detection of Ca2+ by GCaMP-BRPshort is not limited by sensor abundance. Furthermore, we observed a significant difference in the shape of the distribution during 10 Hz stimulation compared to both before stimulation and after ionomycin. The distribution of fluorescence intensities is narrower both at rest and upon ionomycin application; these two distributions should primarily reflect sensor distribution. In contrast, the distribution of GCaMP-BRPshort fluorescence during 10 Hz stimulation is wider, indicating that the sensor is reporting local changes in Ca2+ influx and not just sensor distribution (Figure 5, Figure 5—figure supplement 1C,D). Thus, although GCaMP-BRPshort abundance is likely to contribute to the levels of Ca2+ influx detected, these results are consistent with heterogeneity in Ca2+ influx across individual AZs. We next assayed if Ca2+ influx detected by GCaMP-BRPshort is correlated with Cac channel abundance. Animals expressing both Cac-TdTomato and GCaMP-BRPshort transgenes in the presynaptic compartment displayed a strong correlation between Ca2+ dependent excitation of GCaMP-BRPshort (ΔF) and Cac-TdTomato intensity at individual AZs during stimulation (Pearson r = 0.73, R2 = 0.53, p<0.0001, n = 176 AZs from 7 NMJs from six animals; Figure 5D,E). We observed a weaker correlation between Cac intensity and GCaMP-BRPshort ΔF at rest (Pearson r = 0.18, R2 = 0.03, p<0.001, n = 338 AZs from 8 NMJs from six animals). A few instances were noted where specific AZs experienced a disproportionally low GCaMP-BRPshort ΔF signal relative to their Cac-TdTomato intensity (Figure 5D, arrows), suggesting Ca2+ influx may be fine-tuned at certain release sites. We next analyzed the correlation between GCaMP-BRPshort ΔF induced by 10 Hz stimulation and release rate visualized by postsynaptic myr-jRGECO1a during 1 Hz stimulation (Figure 6A,B). AZs that experienced stronger Ca2+ influx displayed higher Pr during stimulation. Overall, there was a strong correlation between Ca2+ influx and AZ Pr (Pearson r = 0.56, R2 = 0.31, p<0.0001, n = 492 AZs from 6 NMJs from six animals; Figure 6B). In contrast, the frequency of spontaneous vesicle fusion per AZ was only mildly correlated with GCaMP-BRPshort ΔF (Pearson r = 0.23, R2 = 0.07, n = 492 AZs from 6 NMJs from six animals; correlations from a representative experiment shown in Figure 6C). It is worth noting that although a strong correlation between Ca2+ influx and evoked Pr was observed at most AZs, a minority population of release sites that displayed robust Ca2+ influx had very low Pr (Figure 6B). Pr correlates with the relative levels of Ca2+ influx at AZs. (A) Two representative muscle 4 NMJs with AZ Pr heatmaps obtained following myr-jRGECO1a mapping during stimulation (left panel). GCaMP6m-BRPshort fluorescence levels of the same NMJ at rest (second panel) and during stimulation (third panel) are shown. Heatmaps of GCaMP6m-BRPshort ΔF during stimulation are displayed in the right panel. Several representative high Pr AZs that experienced the strongest Ca2+ influx detected by GCaMP6m-BRPshort are noted (arrows). (B) Correlation between GCaMP6m-BRPshort ΔF (during 10 Hz stimulation) and AZ Pr (during 1 Hz stimulation) is shown across all experiments. (C) Representative correlation between GCaMP6m-BRP ΔF and AZ release rate per minute for evoked (red) and spontaneous (green) fusion for a representative single NMJ. To functionally test if the level of Ca2+ influx rather than the structural presence of the Ca2+ channel is responsible for determining Pr, we generated Pr maps in the cacNT27 mutant using dual color quantal imaging with GluRIIA-RFP and myr-GCamP6s (Figure 6—figure supplement 1A). CacNT27 channels have reduced Ca2+ conductance due to a point mutation in the S4 voltage sensor (Rieckhof et al., 2003). We observed that cacNT27 results in a global decrease in Pr across AZs; evoked Pr in controls ranged from 0 to 0.73 with an average of 0.073 ± 0.0021 (n = 1933 AZs from 16 NMJs from 16 animals), while cacNT27 Pr ranged from 0 to 0.47 with a significantly lower average Pr of 0.049 ± 0.0045 (n = 275 AZs from 5 NMJs from five animals; Figure 6—figure supplement 1B). While the entire Pr distribution was shifted lower compared to controls (Figure 6—figure supplement 1C), the normalized distribution of Pr was nearly identical to controls (Figure 6—figure supplement 1D). These findings indicate that the levels of Ca2+ influx through Cac channels, rather than the physical presence of the channels, is a primary determinant of Pr. We next examined if postsynaptic glutamate receptor composition varied at low Pr versus high Pr AZs. Drosophila glutamate receptors at the NMJ assemble as heteromeric tetramers containing three essential subunits (GluRIII, IID and IIE) and a variable fourth subunit of GluRIIA or GluRIIB, with the GluRIIA subtypes having a higher conductance than GluRIIB (Featherstone et al., 2005; Marrus et al., 2004; Petersen et al., 1997; Qin et al., 2005; Schuster et al., 1991). To determine if the GluR subtypes differentially accumulate at AZs in a manner that correlates with presynaptic Pr, we visualized GluRIIA-RFP and GluRIIB-GFP expressed under the control of their endogenous promoters (Rasse et al., 2005). To image myrGCaMP6s activity without obscuring GluRIIB-GFP, myrGCaMP6s was expressed at low levels using the LexA/LexOP system in muscle four with Mef2-LexA. LexA driven myrGCaMP6s signal is dimmer than UAS-myrGCaMP6s at rest and does not obscure the brighter GluRIIB-GFP PSD puncta (Figure 7A). 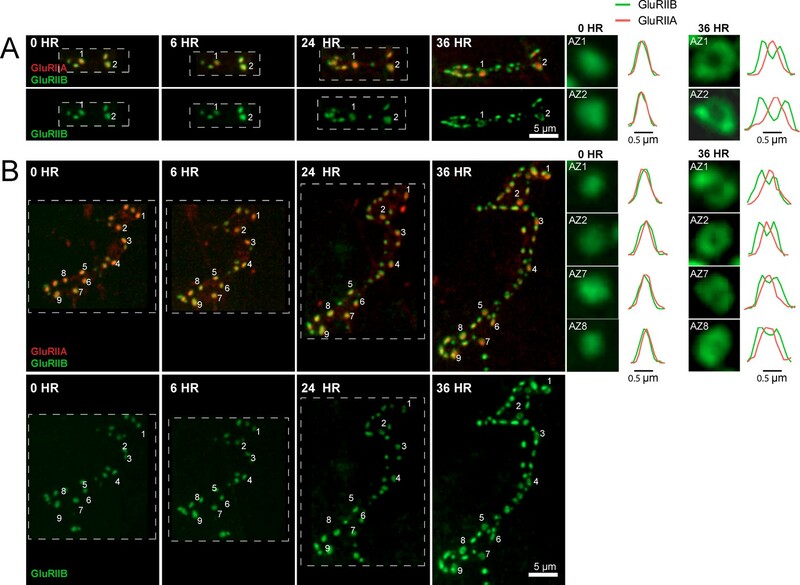 However, upon Ca2+ binding to myrGCaMP6s, the fluorescence dramatically increases compared to the level of endogenous GluRIIB-GFP signal, allowing simultaneous imaging of baseline GluRIIB-GFP levels and synaptic activity detected by myrGCaMP6s (Video 4). High Pr AZs have elevated PSD GluRIIA levels and display a distinct pattern of glutamate receptor clustering. (A) Representative image showing the heterogeneous distribution of GluRIIA-RFP (left panel) at a third instar muscle 4 NMJ. More uniform GluRIIB-GFP PSD puncta can also be observed over the much dimmer myrGCaMP6s (second panel). BRP distribution (third panel) and Pr heatmaps (right panel) for the same NMJ are shown. Several bright GluRIIA fields (intensity two standard deviations above average) are marked with white arrows. The correlation between AZ Pr and GluRIIA-RFP (B), GluRIIB (C) and BRP (D) fluorescence intensity is plotted. (E) Representative images showing distribution of GluRIIA, GluRIIB and BRP, without co-expression of myrGCaMP6s. Synapses containing bright GluRIIA puncta have GluRIIB predominantly localized to the periphery of the PSD (arrows), surrounding a GluRIIA core. These AZs have higher BRP intensities as well. (F) Average fluorescence line profiles showing GluRIIA, GluRIIB and BRP normalized to fluorescence range across average PSDs, separated into two groups according to their GluRIIA brightness, with ‘bright’ PSDs based on their GluRIIA intensity (two standard deviations above average). The peripheral distribution of GluRIIB around central GluRIIA cores was most obvious for bright GluRIIA-positive PSDs that were shown to be more active during stimulation. Correlation between GluRIIA-RFP (G) or GluRIIB-GFP (H) with BRP intensity at individual AZs. 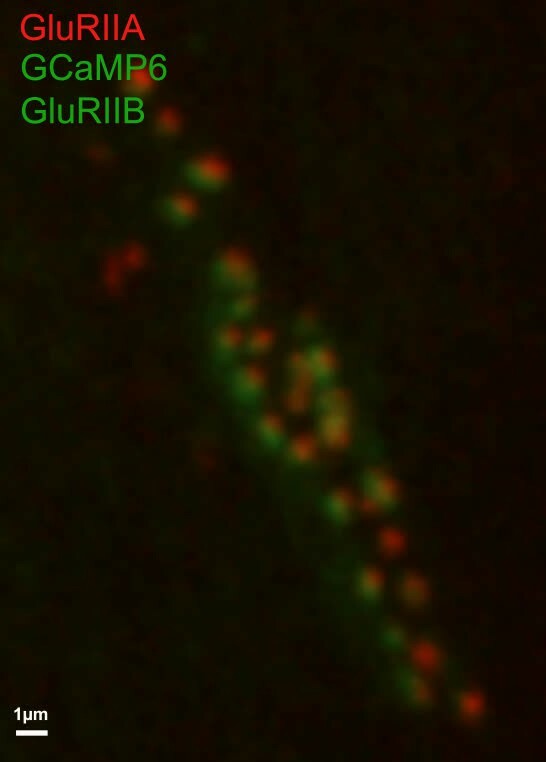 Representative movie showing evoked release events in larvae expressing GluRIIA-RFP (red), GluRIIB-GFP (bright green), and postsynaptic LexAop-myrGCaMP6s. Simultaneous expression of GluRIIA-RFP and GluRIIB-GFP revealed a heterogeneous distribution of each subunit across the AZ population, with GluRIIA levels appearing more variable than GluRIIB (Figure 7A). Similar to the relatively sparse localization of high Pr AZs (Figure 1), a similar sparse distribution of AZs apposed by very bright GluRIIA fields was observed (Figure 7A). To determine if AZs that preferentially accumulate high levels of GluRIIA corresponded to high Pr release sites, we mapped Pr across the AZ population in GluRIIA-RFP/GluRIIB-GFP expressing animals. Analysis of the Pr map revealed a strong positive correlation between mean GluRIIA-RFP intensity and Pr (Pearson r = 0.56, R2 = 0.32, p<0.0001, n = 756 AZs from 8 NMJs from four animals; Figure 7B). In contrast, correlation with the levels of mean GluRIIB-GFP intensity was weaker (Pearson r = 0.32, R2 = 0.1, p<0.0001, n = 756 AZs from 8 NMJs from four animals; Figure 7C). Heterogeneity in GluRIIA PSD brightness and AZ Pr was also observed in syt1 mutants (Figure 2A, arrows). These findings are consistent with previous observations that glutamate receptors preferentially cluster at sites with high Pr based on electrophysiological studies in a Drosophila GluRIII hypomorphic mutant (Marrus and DiAntonio, 2004b). As observed in controls (Figure 1), a positive correlation between AZ Pr and BRP levels was also observed in larvae expressing labeled glutamate receptors (Pearson r = 0.44, R2 = 0.2, p<0.0001, n = 399 AZs from 6 NMJs from four animals; Figure 7D). In summary, these data indicate that GluRIIA accumulates more at PSDs apposing high Pr AZs. Beyond the preferential GluRIIA accumulation at high Pr sites, a change in GluRIIA/B distribution within single PSDs was also observed. PSDs associated with the highest Pr AZs showed a segregated distribution of the receptor subtypes, with GluRIIA concentrating in the center of the receptor field immediately apposing the presynaptic BRP cluster (Figure 7E, arrows). At these sites, GluRIIB occupied a more peripheral position around the central GluRIIA cluster. A similar localization pattern with a ring of GluRIIB surrounding a central GluRIIA patch was previously noted with antibody staining for the two receptors at a population of AZs in wildtype late third instar larvae (Marrus et al., 2004). To analyze this receptor segregation in greater detail, GluRIIA-RFP and GluRIIB-GFP were examined in the absence of co-expressed myrGCaMP6s. Prior analysis (Figure 7B) indicated the brightest GluRIIA PSDs corresponded to high Pr sites. Bright PSDs were selected based on their GluRIIA intensity (two standard deviations above average) and line profiles were drawn across each PSD. The intensity of pixels along that line for each fluorophore was then analyzed. Average pixel intensity revealed drastically distinct profiles for GluRIIB distribution between ‘bright’ and ‘dim’ PSDs classified based on their GluRIIA intensity. GluRIIB was more evenly distributed across the entire PSD at dim GluRIIA sites, but was segregated outward, forming a ring around central GluRIIA puncta at bright GluRIIA sites (Figure 7F). In addition, presynaptic BRP intensity was more strongly correlated with postsynaptic GluRIIA levels (Pearson r = 0.53, R2 = 0.28, p<0.0001, n = 2496 AZs from 19 NMJs from seven animals; Figure 7G) than with GluRIIB (Pearson r = 0.24, R2 = 0.05, p<0.0001, n = 2496 AZs from 19 NMJs from seven animals; Figure 7H). These findings suggest that the postsynaptic cell accumulates GluRIIA and redistributes GluRIIB to the PSD periphery at high Pr sites. The Drosophila larval NMJ is a highly dynamic structure, with new synaptic boutons and AZs undergoing continuous addition throughout development (Harris and Littleton, 2015; Rasse et al., 2005; Schuster et al., 1996; Zito et al., 1999). Given the correlation between Ca2+ channel abundance, GluRIIA/B segregation and high Pr, we were interested in determining how AZs acquire a specific Pr during a larval developmental period that lasts 6–7 days. One model is that certain AZs gain a higher Pr status during development through preferential accumulation of key AZ components compared to their neighbors. Alternatively, high Pr AZs might simply be more mature than their low Pr neighbors, having an earlier birthdate and a longer timeframe to accumulate AZ material. To test these models for release heterogeneity, it would be desirable to follow Pr development from the embryonic through larval stages. However, this is not technically feasible due to the small size of AZs and the rapid locomotion that larvae undergo, preventing generation of Pr maps in moving animals. Instead, we employed an alternative intravital approach to repeatedly image the same NMJ at muscle 26 directly through the cuticle of intact larvae during anesthesia (Andlauer and Sigrist, 2012; Fouquet et al., 2009; Füger et al., 2007; Rasse et al., 2005; Zhang et al., 2010). During anesthesia, endogenous action potential-induced release and the associated GCaMP signals were eliminated, preventing direct Pr measurements in anesthetized larvae. We instead focused on imaging GluRIIA accumulation and GluRIIA/B segregation, which was strongly correlated with Pr (Figure 7), as a proxy for the emergence of high Pr sites. Previously described in vivo imaging approaches with anesthesia at Drosophila NMJs employed early third instar larvae as the starting time point, and followed the distribution of fluorescently-labeled synaptic proteins during the final ~36 hr of development prior to pupation (Andlauer and Sigrist, 2012; Fouquet et al., 2009; Füger et al., 2007; Rasse et al., 2005; Zhang et al., 2010). To follow AZ Pr development beginning soon after synapse formation, we modified these techniques to allow imaging of glutamate receptors at earlier stages of development (see Materials and methods). This allowed successful birth dating and successive imaging of the same AZ over a 6 day period beginning shortly after synapse formation in the early first instar period through the late third instar stage (Figure 7—figure supplement 1). In early first instar larvae (within 12 hr of hatching) GluRIIA and GluRIIB were largely co-localized at postsynaptic puncta (Figure 7—figure supplement 1). One exception was the presence of diffuse GluRIIA that accumulated around unusually long axonal extensions that emerged from presynaptic boutons (Figure 7—figure supplement 2). These structures were devoid of any detectable GluRIIB or the bright GluRIIA puncta that are associated with AZs, and may be remnants of previously described muscle filopodial structures, termed myopodia, that interact with presynaptic filopodia to dynamically regulate early synaptic target recognition (Kohsaka and Nose, 2009; Ritzenthaler et al., 2000; Ritzenthaler and Chiba, 2003). GluRIIA was diffusely present on these structures, as has been observed for the leucine-rich repeat cell adhesion protein Capricious (Kohsaka and Nose, 2009). Repeated imaging of these thinner GluRIIA-positive processes revealed that they were capable of developing into mature synaptic boutons with concentrated GluRIIA and GluRIIB synaptic puncta (Figure 7—figure supplement 3). By 24 hr of larval growth, GluRIIA rich extensions were no longer observed, indicating these structures are restricted to early developmental stages. Prior studies indicated GluRIIA PSD levels closely track with Cac accumulation at corresponding AZs of third instar larvae (Fouquet et al., 2009; Rasse et al., 2005), indicating the two compartments are likely to mature at similar rates. To examine this directly, we assayed whether GluRIIA and Cac accumulation were correlated during earlier stages of development (Figure 7—figure supplement 3). Indeed, the intensity of Cac-GFP and GluRIIA-RFP puncta were strongly correlated at individual AZs during both early and late larval development (first instar; Pearson r = 0.82, R2 = 0.6771, p<0.0001, n = 441 AZs from 8 NMJs from eight animals; third instar; Pearson r = 0.63, R2 = 0.395, n = 874 AZs from 8 NMJs from five animals; Figure 7—figure supplement 3D,E). 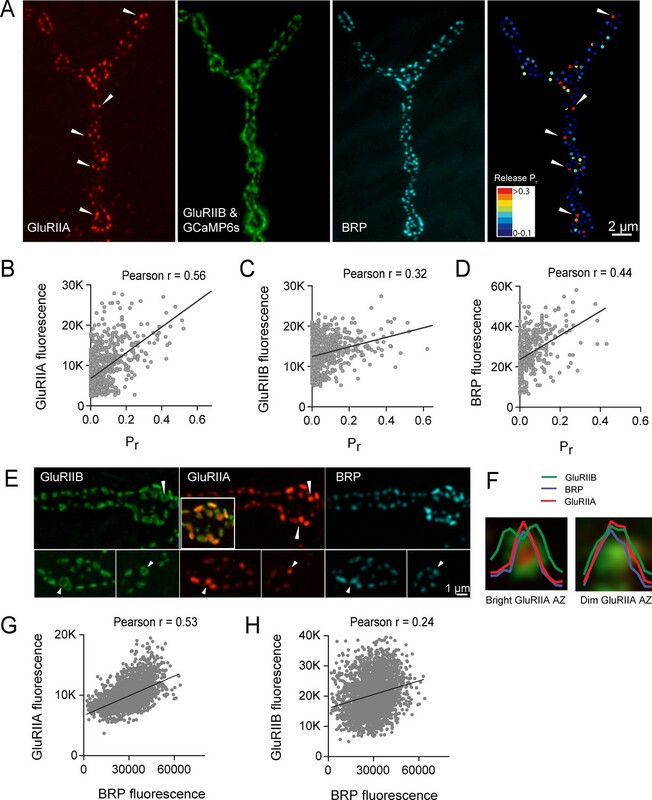 One exception was observed in very early first instar larvae, where a few Cac-GFP puncta accumulated along the previously described GluRIIA positive axonal extensions prior to the specific accumulation of GluRIIA at PSDs (Figure 7—figure supplement 3A). 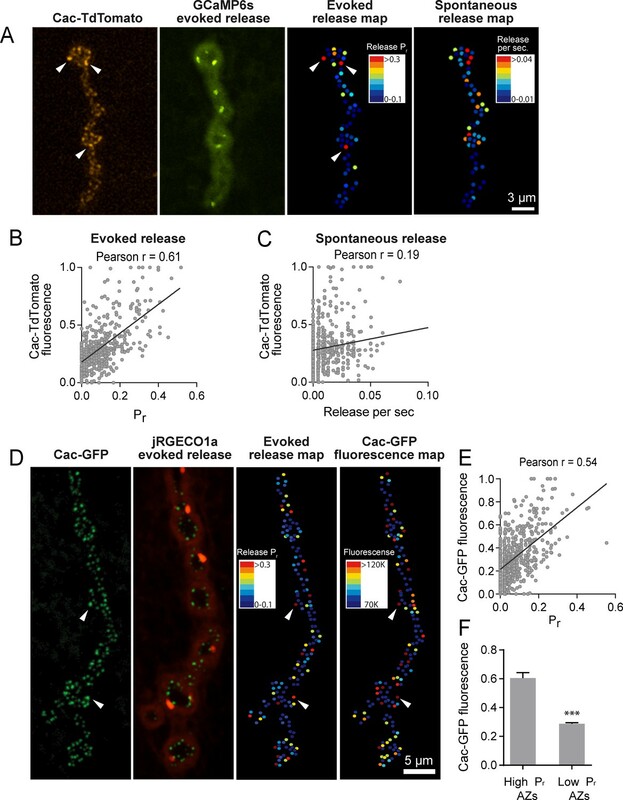 In contrast, postsynaptic appearance of GluRIIA at the PSD could be observed to slightly precede the accumulation of Cac-GFP at later developmental stages (Figure 7—figure supplement 3B,C), similar to previous observations at mature third instar NMJs (Rasse et al., 2005). In summary, the intensity of Cac-GFP and GluRIIA-RFP puncta are strongly correlated at AZs during larval development, indicating that GluRIIA provides a robust marker that reflects the corresponding levels of presynaptic Cac at individual AZs. We examined how GluRIIA accumulation and GluRIIA/B segregation emerged during development of the NMJ. Live imaging of GluRIIA and GluRIIB distribution at early PSDs in anesthetized first instar larvae demonstrated that the receptors were co-localized and lacked the segregation where GluRIIB clustered around central GluRIIA puncta that was observed at high Pr sites later in development (Figure 8A). The first emergence of GluRIIA/B segregation was observed after 36 hr of imaging starting from the first instar period. The GluRIIA/B segregation always emerged first at the oldest synapses that existed previously on the first day of imaging (Figure 8A,B). The most mature PSDs also contained more GluRIIA fluorescent signal (17430 ± 634.0, n = 86 AZs from 8 NMJs from five animals) compared to younger synapses that emerged during the 48 hr imaging session (8909 ± 289.8, n = 210 AZs from 8 NMJs from five animals). During later larval development, the cuticle thickness changed dramatically and prevented reliable comparison of absolute receptor density with earlier stages. However, GluRIIA intensities that were more uniform at the first instar larval stage became more heterogeneous at the third instar stage (Figure 8—figure supplement 1). Indeed, histograms of normalized fluorescence intensity (relative intensity scaled from 0 to 1) revealed that GluRIIA and GluRIIB were relatively uniformly distributed at first instar larval PSDs, with GluRIIA distribution becoming more skewed at later stages (Figure 9A,B). To determine whether muscle 26 exhibits Pr heterogeneity similar to muscle 4, we performed Pr mapping using GluRIIA-RFP and myr-GCaMP6s in dissected non-anesthetized third larvae and confirmed that Pr heterogeneity is extremely similar between muscle 26 (mean Pr = 0.068 ± 0.0048, skewness = 2.27, 365 AZs from 5 NMJs from five animals) and muscle 4 (mean Pr = 0.073 ± 0.0021, skewness = 2.23, 1933 AZs from 16 NMJs from 16 animals; Figure 9—figure supplement 1B–D). These results indicate that GluRIIA/B fluorescence and Pr distribution are both highly heterogeneous by the early third instar stage in muscle 26, with the brightest GluRIIA PSDs, and by extension their corresponding high Pr AZs, representing those that appeared earliest in development. Glutamate receptor segregation during PSD development. (A) Representative serial time points of NMJ development visualized by repeated imaging through the cuticle of an anesthetized larvae at the indicated time points beginning at the early first instar stage. Two of the five brightest PSDs present during the first imaging session are labeled and are the first to develop the peripheral GluRIIB segregation pattern 36 hr later. GluRIIB labeling alone is shown in the bottom panel. The right panels show GluRIIB fluorescence and normalized GluRIIA and GluRIIB fluorescent line profiles for the indicated PSDs at the initial imaging session (0 hr) and 36 hr later. (B) Serial images of an NMJ with a larger number of AZs present at the first instar stage. After 36 hr of development, the peripheral segregation of GluRIIB around GluRIIA was first observed in some of the PSDs that were present during the initial imaging session (numbered). The right panels show GluRIIB fluorescence and normalized GluRIIA and GluRIIB fluorescent line profiles for the indicated PSDs at the initial imaging session (0 hr) and 36 hr later. The dashed box surrounds the actual imaged segment of the NMJ in each panel. Rate of acquisition of glutamate receptor segregation during development. Histograms of the distribution of normalized GluRIIA and GluRIIB fluorescence at the first instar (day 1) (A) and third instar (day 4) (B) stages for muscle 26 imaged through the cuticle of anesthetized larvae. For each data set, GluRIIA and GluRIIB fluorescence is presented from dimmest (0) to brightest (1). GluRIIA shows a more skewed distribution of fluorescence at day 4, consistent with its accumulation at high Pr AZs. (C) Representative muscle 26 NMJ image sequence showing appearance and maturation of two new synapses (#3 and 4) that were not present in the initial imaging session. Several preexisting synapses (#1 and 2) that developed the typical GluRIIB donut structure later in development are also labeled. The dashed box surrounds the actual imaged segment of the NMJ. New GluRIIA and GluRIIB clusters appear initially as small puncta (day 2, arrows) that become brighter on day 3. By day four they begin to display the donut like GluRIIB profile. At day 5, GluRIIB distribution to the periphery around a bright GluRIIA PSD representative of high Pr sites becomes prominent. The bottom panels show normalized GluRIIA and GluRIIB fluorescent line profiles for the newly identified PSDs (#3, 4) throughout the 5 day imaging series. (D) Diameter of glutamate receptor fields during the first 72 hr of PSD development. Error bars represent SEM. (E) Changes in AZ number during larval maturation at muscle 26 presented as a ratio of AZs observed during the first day of imaging (day 1). (F) Representative serial time points of GluRIIA-RFP in vivo imaging over 24 hr (left two panels). Newly formed PSDs are marked with white arrows; these displayed uniformly low Pr during release mapping (right panel). Several older PSDs with bright GluRIIA intensity are denoted with white numbers. (G) Average Pr of old AZs (those present in the 0 hr time point initial imaging session) and new AZs (AZs under 24 hr old that were first seen at the 24 hr time point). Student’s t-test was used for statistical analysis (***=p ≤ 0.001). Error bars represent SEM. Over what time frame do synapses developmentally acquire markers of high Pr sites? To estimate the average time required for AZ maturation, we calculated the time interval from the first emergence of a PSD in an imaging session to the time point when segregation of GluRIIB around GluRIIA central puncta occurred. This analysis was restricted to newly formed AZs that appeared during the imaging sessions and excluded AZs that were present in the first imaging session performed in first instar larvae. The average time from the first emergence of a PSD to when it acquired the segregated GluRIIA/B pattern observed at high Pr AZs was 3.20 ± 0.08 days (n = 41 AZs from 7 NMJs from three animals; Figure 9C). In a small subset of PSDs (5%), a slightly faster accumulation of GluRIIA and the formation of GluRIIB peripheral rings was observed, but never faster than 2 days. In addition, glutamate receptor fields increased in size throughout the first 72 hr of development (Figure 9D). GluRIIA diameter increased by 1.47-fold during the first 24 hr of development but then plateaued, while GluRIIB field diameter continued to grow over 72 hr, increasing in size by 2.8-fold over that time. At 72 hr after initial glutamate receptor field formation, the average GluRIIA field diameter was 0.59 ± 0.058 μm (range 0.45–0.80 μm, 12 PSDs from three animals) and the average GluRIIB field diameter was 1.01 ± 0.035 μm (range 0.89–1.12 μm, 12 PSDs from three animals), consistent with the formation of segregated GluRIIA/B fields at mature AZs. To directly assess whether AZ age corresponds to Pr, we followed PSDs in animals expressing GluRIIA-RFP, GluRIIB-GFP and myr-GCaMP for 24 hr using in vivo imaging, and then dissected the animals and mapped Pr directly (Figure 9F). We observed that PSDs that emerged on the second day of imaging (less than 24 hr old) were consistently associated with very low Pr AZs. The mean Pr of these newly-formed AZs was 0.035 ± 0.0047 (n = 77 AZs from 4 NMJs from four animals), with a range of 0–0.14. In contrast, the average Pr for AZs older than 24 hr was 0.14 ± 0.0093 with a range of 0–0.61 (n = 188 AZs from 4 NMJs from four animals; Figure 9G). These findings support a model in which the vast majority of newly formed AZs are very weak, with increased Pr requiring more than 24 hr to develop. Given the developing NMJ is adding AZs at a rapid rate (Rasse et al., 2005; Schuster et al., 1996), we estimated whether AZ maturation time identified over the course of our live imaging experiments could lead to the ~10% of high Pr sites observed at the early third instar stage. We quantified the number of synapses present at the same NMJ from the first instar through the early third instar stage from live imaging experiments (Figure 9E). AZ number roughly doubled each day, such that the average number of AZs found at the first instar stage (day 1) represented 14.7 ± 1.4% (n = 8 NMJs from three animals) of all AZs present by day 4 (3 days after initial imaging in first instars). Overall, these data are consistent with the hypothesis that AZ maturation is a key factor in regulating Pr, leading to increased accumulation of Ca2+ channels and GluRIIA/B segregation at high Pr sites compared to AZs that are newly formed (<2 days). If heterogeneity in AZ age underlies the majority of diversity in Pr, we would expect to see a different Pr distribution at the earlier second instar stage when there is a smaller range of AZ ages. Since the number of AZs nearly doubles each day and newly formed AZs display low Pr, we hypothesized that third instar NMJs would have a greater proportion of low Pr sites compared to second instar NMJs. To test this hypothesis, we mapped Pr at muscle 4 NMJs in the second instar and compared the distribution to that seen at the third instar stage (Figure 9—figure supplement 1A,B). A rightward shift in the distribution of Pr was observed in the earlier second instar stage, with a greater proportion of AZs in the higher Pr category, a smaller population of low Pr AZs, and a significant increase in mean Pr in second instars compared to third instars (third instar: 0.07 ± 0.002, n = 1933 AZs from 16 NMJs from 16 animals; second instar: 0.13 ± 0.008, n = 282 AZs from 6 NMJs from six animals; Figure 9—figure supplement 1C,D). We were unable to map Pr at muscle 26 in earlier stages in dissected animals because it is covered by muscles 6 and 7 until the third instar stage. These data support the hypothesis that Pr heterogeneity reflects AZ age and maturation time. To determine whether the developmental time-course of synapse maturation could be modulated by changes in presynaptic activity, we measured the rate of PSD growth (fold-increase in GluRIIB area over 24 hr) and the percent of PSDs displaying GluRIIA/B segregation in mutants with altered presynaptic activity (Figure 10). We first measured postsynaptic maturation in BRP69/def null animals, which have a dramatic reduction in evoked synaptic transmission (Kittel et al., 2006). Consistent with previous findings, Cac-GFP intensity in BRP69/def animals was reduced to 25% (mean fluorescence intensity 3549 ± 23, 4 NMJs from two animals) of control levels (mean intensity 14177 ± 220, 4 NMJs from four animals; Figure 10—figure supplement 1A,B). We expressed GluRIIA-RFP and GluRIIB-GFP in BRP69/def mutants and imaged muscle 26 NMJs in anesthetized larvae intravitally over 24 hr. A significant reduction in postsynaptic maturation rate was observed; newly formed BRP69/def PSDs only increased in GluRIIB area by 1.16-fold (±0.11, 4 NMJs from three animals) over the first 24 hr of development, compared to a 1.61-fold (±0.11, 5 NMJs from five animals) increase in controls (Figure 10A,C). Furthermore, a significant reduction in the percent of PSDs with GluRIIA/B rings (defined by a > 10% central dip in the GluRIIB intensity profile) was observed in the second day of larval development; only 4.9% of BRP69/def PSDs (±1.3%, 10 NMJs from five animals) showed receptor segregation compared to 22% (±5%, 11 NMJs from five animals) in age-matched controls (Figure 10D). We were unable to observe any GluRIIB rings at the third instar stage in BRP69/def, in contrast to the clear rings seen in controls at this stage. Instead, BRP69/def mutants displayed highly disorganized GluR clusters (Figure 10B). Glutamate receptor field maturation in mutants with altered presynaptic activity. (A) Representative NMJs on muscle 26 for each genotype imaged intravitally over 24 hr; the 0 hr timepoint (left column) corresponds to imaging during the early first instar stage. White arrows (24 hr) denote PSDs that have acquired GluRIIA/IIB segregation at this time point. (B) Representative third instar PSDs. (C) Fold-increase in GluRIIB area over 24 hr in newly formed PSDs. (D) Percent of PSD fields with GluRIIB rings at the second instar stage. A PSD was considered to have a GluRIIB ring if the line profile through the GluRIIB field had a central dip in fluorescence intensity of greater than 10%. (E) Fold increase in PSD number, defined by the number of GluRIIB puncta, over 24 hr of imaging beginning in the first instar stage. (C–E) Each point represents the average from one NMJ. One way ANOVA followed by Dunnett’s multiple comparisons test was used for statistical analysis (*=p ≤ 0.05, **=p ≤ 0.01, ***=p ≤ 0.001). Error bars represent SEM. To examine the consequences of reductions in presynaptic activity independent of structural alterations in the AZ that might occur at NMJs in BRP mutants, we measured PSD maturation rate in napTS and syt1null mutants that reduce release through separate mechanisms. Loss of Syt1 causes a dramatic decrease in synchronous fusion (DiAntonio and Schwarz, 1994; Guan et al., 2017; Lee et al., 2013; Littleton et al., 1994, 1993; Yoshihara et al., 2003; Yoshihara and Littleton, 2002), while napTS results in constitutively reduced neuronal excitability due to decreased sodium channel activity (Kernan et al., 1991; Wu et al., 1978). In both syt1 and napTS mutants, significantly reduced PSD growth rate and GluRIIA/B segregation was observed compared to controls; GluRIIB field area in napTS and syt1null mutants only increased by 1.24-fold (±0.05 4 NMJs from three animals) and 1.15-fold (±0.05, 4 NMJs from four animals) respectively during the first 24 hr of PSD development compared to 1.61-fold (±0.11, 5 NMJs from five animals) in controls (Figure 10C). At the second instar stage, when 22% of control PSDs displayed GluRIIA/B segregation, only 5.4% of syt1 (±1.5%, 7 NMJs from three animals) and 6.0% of napTS (±2.0%, 13 NMJs from four animals) PSDs showed GluR segregation (Figure 10D). Both napTS and syt1null mutants also formed less segregated GluRIIA/B fields compared to controls at the third instar stage (Figure 10B). To determine whether increasing presynaptic release would accelerate maturation, we examined PSD size and GluR segregation in shaker120, eag1 (sh, eag) double mutants that display increased excitability due to loss of several K+ currents (Ganetzky and Wu, 1983; Salkoff and Wyman, 1981; Wu et al., 1983). Sh, eag showed a significantly increased rate of GluRIIB field size increase (2.37-fold ± 0.11, 5 NMJs from four animals) over 24 hr compared to controls (1.61 fold (±0.11, 5 NMJs from five animals; Figure 10A,C). Furthermore, 48.7% of sh, eag mutant PSDs (±4.4%, 13 NMJs from five animals) displayed GluRIIB rings at the early second instar stage, compared to only 22% of control PSDs (Figure 10D). These observations indicate that increasing (sh, eag) or decreasing (napTS, BRP69/def, syt1) presynaptic activity results in a respective increase or decrease in PSD maturation rate. One factor that might contribute to these changes in PSD maturation rate is altered growth rate of the entire NMJ secondary to changes in neuronal activity. Indeed, we observed that the rate of new PSD addition over 24 hr in BRP69/def, napTS, and sh, eag mutants showed a similar trend to PSD maturation, suggesting that overall NMJ growth rate is altered in these mutants (control animals increase AZ number by 1.8 ± 0.1 fold over 24 hr compared to sh, eag (2.2 ± 0.1 fold), napTS (1.3 ± 0.04 fold), syt1 (1.5 ± 0.08 fold), and BRP69/def (1.2 ± 0.06 fold); Figure 10E). Previous work on activity-dependent NMJ growth in Drosophila focused primarily on bouton number, not AZ addition rate, and it will be interesting to explore the molecular mechanisms mediating activity-dependent seeding of new AZs. To measure PSD maturation rate in the context of an otherwise healthy animal, we took advantage of the rab3 null mutant, where roughly half of the PSDs are apposed by presynaptic areas lacking BRP and Cac, and the remaining AZs contain higher than normal levels of these presynaptic components (Graf et al., 2009). Rab3 AZs containing BRP and Cac have been shown to have higher Pr, whereas AZs lacking these presynaptic components are functionally silent (Peled and Isacoff, 2011). This redistribution of Pr provides an opportunity to compare PSD maturation with less influence of overall animal health and NMJ growth rate. The rab3 phenotype has been previously analyzed at the third instar stage of larval development. To characterize the dynamics of pre- and postsynaptic maturation during earlier development, we followed rab3 animals expressing Cac-GFP and GluRIIA-RFP for 48 hr starting in the early first instar larval stage. 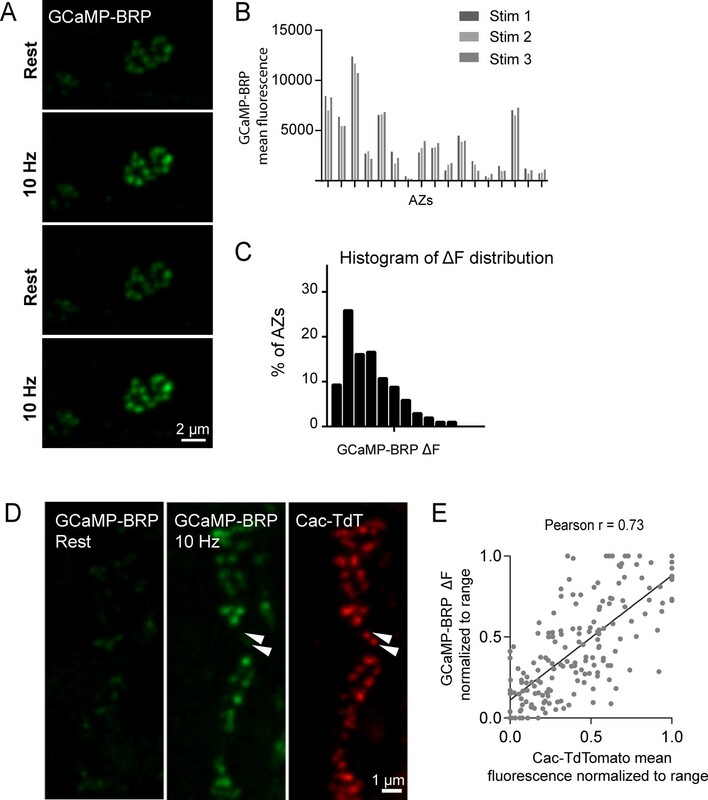 AZs populated with Cac-GFP early in development were stable over time; Cac-GFP was never lost at these AZs over 48 hr of imaging (Figure 10—figure supplement 1E). However, a divergence in the rate of PSD versus Cac-GFP addition was observed after the first instar stage; new GluRIIA-containing PSDs were added to the NMJ at a rate similar to control, with total PSD number nearly doubling every 24 hr. However, the rate of addition of new Cac-GFP-containing AZs was much lower than in controls, resulting in a decrease in Cac/GluRIIA apposition in rab3 mutants over development (Figure 10—figure supplement 1D,F). This is consistent with the observation that PSD growth rate was decreased in the rab3 null (1.23-fold ± 0.05, 6 NMJs from six animals) when we measured PSDs born in the late first instar or early second instar stage (Figure 10C), while the percent of GluRIIA/B rings seen in the second instar stage was elevated (34.7 ± 3.3% of PSDs had rings, 14 NMJs from six animals) compared to age matched controls (22%; Figure 10D). To avoid complications from the atypical dynamics of AZ apposition during rab3 NMJ development, we focused the remainder of our analysis on the early first instar stage where the age distribution of AZs is much narrower. We next examined first instar rab3 mutants to determine whether AZs with higher presynaptic activity had more mature postsynaptic receptor fields than their silent neighbors. We imaged GluRIIA-RFP and GluRIIB-GFP in rab3 1st instars and then dissected and stained for BRP. In muscle 26 of rab3 mutants, roughly 50% of first instar AZs were populated with BRP (the ratio of GluRIIA-RFP puncta to Cac-GFP puncta was 1.9 ± 0.15); these AZs were opposed by large PSDs, many of which already showed GluRIIA/IIB segregation (Figure 10D, Figure 10—figure supplement 1C). In contrast, PSDs lacking BRP were much smaller and lacked receptor segregation. 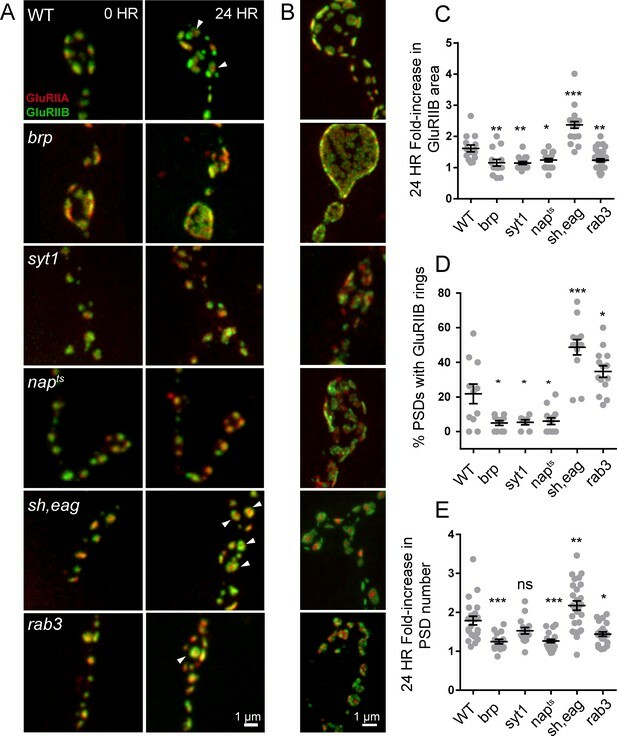 All of the PSDs with GluRIIB rings were BRP-positive, suggesting that PSDs opposite AZs with reduced presynaptic release are less mature at this stage of larval development. Though the mechanism by which rab3 regulates AZ assembly remains unknown, the larger PSD size and enhanced GluRIIA/B segregation opposite BRP-positive AZs and the small size and lack of receptor segregation opposite BRP-negative AZs within the same terminal suggests that PSD maturation depends on presynaptic activity at the level of individual AZs. In the current study we used quantal imaging, super resolution SIM, and intravital imaging to examine the development of heterogeneity in evoked Pr across the AZ population at Drosophila NMJs. We first confirmed that release heterogeneity was not caused by summation of fusion events from multiple unresolvable AZs. Indeed, high Pr sites corresponded to single AZs with enhanced levels of BRP. These findings are consistent with previous observations using conventional light microscopy that indicate Pr correlates with BRP levels (Muhammad et al., 2015; Peled et al., 2014; Reddy-Alla et al., 2017). By monitoring release over intervals of extensive vesicle fusion during strong stimulation, we also observed that Pr is a stable feature of each AZ. In addition, loss of the synaptic vesicle Ca2+ sensor Syt1 globally reduced Pr without altering the heterogeneous distribution of Pr across AZs, indicating that AZ-local synaptic vesicle pools with differential Ca2+ sensitivity are not likely to account for Pr heterogeneity. Since VGCC abundance, gating, and organization within the AZ are well established regulators of Pr across synapses (Borst and Sakmann, 1996; Chen et al., 2015; Meinrenken et al., 2002Zito et al., 1999; Nakamura et al., 2015; Sheng et al., 2012; Südhof, 2012; Wang et al., 2008), heterogeneity in presynaptic Ca2+ channel abundance was a clear candidate for the generation of Pr heterogeneity at Drosophila NMJs. Indeed, the Cac Ca2+ channel responsible for neurotransmitter release is heterogeneously distributed across the NMJ (Fouquet et al., 2009; Kawasaki et al., 2004; 2000; Littleton and Ganetzky, 2000; Liu et al., 2011; Rieckhof et al., 2003; Smith et al., 1996). Using transgenically labeled Cac lines, we observed that Cac density at AZs is indeed strongly correlated with Pr. To directly visualize presynaptic Ca2+ influx at single AZs, we generated GCaMP fusions to the core AZ component BRP. Ca2+ influx at single AZs was highly correlated with both Cac density and Pr. The cacNT27 mutant with decreased conductance also resulted in a global reduction in Pr without disrupting heterogeneity, further confirming that Ca2+ influx regulates Pr across the range of release heterogeneity. Postsynaptically, high Pr AZs were enriched in GluRIIA-containing receptors and displayed a distinct pattern of glutamate receptor clustering. While most synapses showed GluRIIA and GluRIIB spread over the entire PSD, high Pr AZs were apposed by PSDs where GluRIIA concentrated at the center of the AZ, with GluRIIB forming a ring at the PSD periphery. Indeed, anti-glutamate receptor antibody staining of wildtype larvae lacking tagged glutamate receptors had previously identified a GluRIIB ring around the GluRIIA core in some mature third instar NMJ AZs (Marrus et al., 2004). In addition, activity-dependent segregation of GluRIIA and a GluRIIA gating mutant has been observed at individual AZs in Drosophila (Petzoldt et al., 2014). The correlation of Pr with GluRIIA accumulation is especially intriguing considering that this subunit has been implicated in homeostatic and activity-dependent plasticity (Davis, 2006; Frank, 2014; Petersen et al., 1997; Sigrist et al., 2003). By following the developmental acquisition of this postsynaptic property as a proxy for Pr from the first through third instar larval stages via intravital imaging in control and mutant backgrounds, we observed that the earliest formed AZs are the first to acquire this high Pr signature over a time course of ~3 days, and that PSD maturation rate can be modulated by changes in presynaptic activity. Similar to prior observations (Melom et al., 2013; Peled and Isacoff, 2011), we found that most AZs at the Drosophila NMJ have a low Pr. For the current study, the AZ pool was artificially segregated into low and high release sites, with high releasing sites defined based on having a release rate greater than two standard deviations above the mean. Given that birthdate is a key predictor of glutamate receptor segregation, and by proxy Pr, we expect the AZ pool to actually reflect a continuum of Pr values based on their developmental history. However, using the two standard deviation criteria, 9.9% of AZs fell into the high Pr category, with an average Pr of 0.28. We also observed that 9.7% of the AZs analyzed displayed only spontaneous release. We could detect no fusion events for either evoked or spontaneous release for another 14.6% of AZs that were defined by a GluRIIA-positive PSD in live imaging. Future investigation will be required to determine whether these cases represent immature AZs with extremely low evoked Pr, or distinct categories reflective of differences in AZ content. The remaining AZs that participated in evoked release had an average Pr of 0.05. Ca2+ channel density and Ca2+ influx at individual AZs was a key determinant of evoked Pr heterogeneity, as Pr and the intensity of Cac channels tagged with either TdTomato or GFP displayed a strong positive correlation. Spontaneous fusion showed a much weaker correlation with both Cac density and Ca2+ influx at individual AZs, consistent with prior studies indicating spontaneous release rates are poorly correlated with external Ca2+ levels at this synapse (Jorquera et al., 2012; Lee et al., 2013). With synaptic vesicle fusion showing a steep non-linear dependence upon external Ca2+ with a slope of ~3–4 (Dodge and Rahamimoff, 1967; Heidelberger et al., 1994; Jan and Jan, 1976), a robust change in Pr could occur secondary to a relatively modest increase in Ca2+ channel abundance over development. Although the number of VGCCs at a Drosophila NMJ AZ is unknown, estimates of Cac-GFP fluorescence during quantal imaging indicate a ~ 2 fold increase in channel number would be necessary to move a low Pr AZ into the high Pr category. Similar correlations between evoked Pr and Ca2+ channel abundance have been found at mammalian synapses (Holderith et al., 2012; Nakamura et al., 2015; Sheng et al., 2012), suggesting this represents a common evolutionarily conserved mechanism for determining release strength at synapses. We did not test the correlation of Pr with other AZ proteins besides Cac and BRP, but it would not be surprising to see a positive correlation with the abundance of many AZ proteins based on the observation that maturation time is a key determinant for Pr. Indeed, recent studies have begun to correlate Pr with specific AZ proteins at Drosophila NMJs (Reddy-Alla et al., 2017). We also observed that PSD size was robustly increased by 1.6-fold over a 24 hr period of AZ development during the early larval period in control animals. 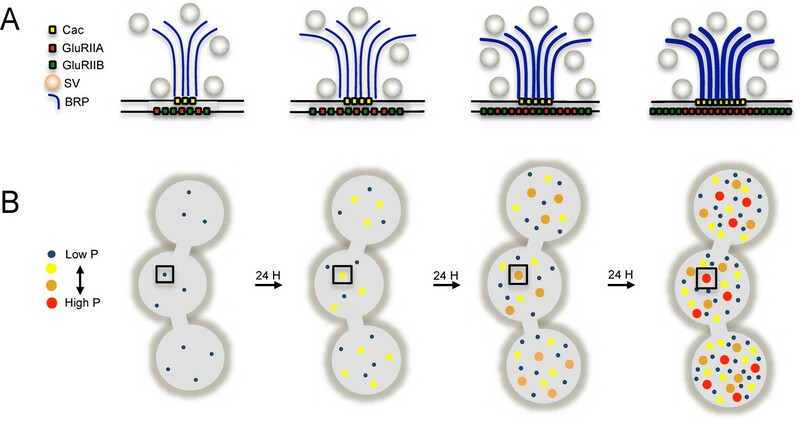 AZ maturation is likely to promote increased synaptic vesicle docking and availability, consistent with observations that correlate AZ size with either Pr or the readily releasable pool (Han et al., 2011; Holderith et al., 2012; Matkovic et al., 2013; Matz et al., 2010; Nakamura et al., 2015; Schikorski and Stevens, 1997; Wadel et al., 2007). We considered several models for how AZs acquire this heterogeneous nature of Pr distribution during a developmental period lasting several days. One possibility is that unique AZs gain high Pr status through a mechanism that would result in preferential accumulation of key AZ components compared to their neighbors. Given that retrograde signaling from the muscle is known to drive synaptic development at Drosophila NMJs (Ball et al., 2010; Berke et al., 2013; Harris and Littleton, 2015; Keshishian and Kim, 2004; McCabe et al., 2003; Piccioli and Littleton, 2014; Yoshihara et al., 2005), certain AZ populations might have preferential access to specific signaling factors that would alter their Pr state. Another model is that AZs compete for key presynaptic Pr regulators through an activity-dependent process. High Pr AZs might also be more mature than their low Pr neighbors, having a longer timeframe to accumulate AZ components. Given the Drosophila NMJ is constantly forming new AZs at a rapid pace during development (Rasse et al., 2005; Schuster et al., 1996), newly formed AZs would be less mature compared to a smaller population of ‘older’ high Pr AZs. To examine if the release heterogeneity observed at the third instar stage reflects AZ birth order over several days of development, we needed to extend the intravital imaging through a longer time period beginning in the first instar larval stage. GCaMP imaging indicated high Pr sites segregate GluRIIA and GluRIIB differently from low Pr sites, with the IIA isoform preferentially localizing at the center of PSDs apposing high Pr AZs. As such, we used developmental acquisition of this property as an indicator of high Pr sites. Although segregation of glutamate receptors may not perfectly replicate the timing of Pr acquisition during development, it is currently the best tool for estimating Pr during sequential live imaging. Based on the acquisition of GluRIIA/B segregation, the data support the hypothesis that increases in Pr reflect a time-dependent maturation process at the NMJ. The continuous addition of new AZs, which double in number during each day of development, ensures that the overall ratio of high to low Pr sites represents a low percentage as the NMJ grows (Figure 11). We further established confidence in the age-dependency model of Pr by mapping release after following NMJs intravitally for 24 hr; using this approach, we found that newly formed AZs are consistently very low Pr. Finally, we mapped Pr in the second instar stage and observed that the heterogeneity at this stage is shifted towards higher releasing sites, with a reduction in the fraction of low-releasing sites. Model depicting the acquisition of release heterogeneity over three days of NMJ development. (A) Presynaptically, Ca2+ channels (yellow) and BRP (blue) are added over time to increase release probability. Postsynaptically, GluRIIA and GluRIIB are added during maturation and eventually segregate at high releasing sites. (B) The number of AZs roughly doubles every 24 hr, with all new AZs having low release probability (blue dot). AZs increase in release probability over time and eventually reach high Pr status (red dot). These data indicate AZs are born with low Pr and gain pre- and postsynaptic material over 3 days on an upward trajectory toward higher Pr status (Figure 11). Is AZ age a static determinant of Pr, or can growth rate be regulated to allow faster or slower acquisition of high Pr AZs? To answer this question, we assayed whether mutants that alter presynaptic activity influence the rate of PSD growth and GluRIIA/B segregation. In BRP69/def, syt1null, and napTS mutants with decreased presynaptic release, a significant reduction in postsynaptic maturation rate and in the percentage of PSDs with GluRIIA/IIB rings was observed. Conversely, in the shaker, eag double mutant with increased presynaptic excitability, a significantly increased rate of GluRIIB field size and a significant increase in GluRIIA/IIB rings was found compared to controls. To investigate whether differences in synapse growth and maturation rate could be seen between AZs enriched in BRP and Cac versus neighboring AZs that are deficient in these components, we imaged development in the rab3 null mutant. At the first instar stage when AZs are roughly age matched, release sites enriched in presynaptic components had developed large and mature PSDs in stark contrast with non-enriched AZs, whose PSDs appeared immature. These results indicate that PSD maturation can be influenced by presynaptic activity at the resolution of single AZs. Although how AZs are assembled during development is still being established, our data do not support a model where AZs are fully preassembled during transport and then deposited as a single ‘quantal’ entity onto the presynaptic membrane. Rather, these data support a model of seeding of AZ material that increases developmentally over time as AZs matures, consistent with previous studies of AZ development in Drosophila (Böhme et al., 2016; Fouquet et al., 2009). Although no evidence for rapid changes in Pr were detected in the steady-state conditions used in the current study, homeostatic plasticity is known to alter Pr over a rapid time frame (~10 min) at the NMJ (Davis and Müller, 2015; Frank, 2014; Frank et al., 2006). It will be interesting to determine if Cac abundance can change over such a rapid window, or whether the enhanced release is mediated solely through changes in Cac function and Ca2+ influx (Müller and Davis, 2012). Changes in the temporal order of Pr development could also occur secondary to altered transport or capture of AZ material. For example, the large NMJ on muscle fibers 6 and 7 displays a gradient in synaptic transmission, with terminal branch boutons often showing a larger population of higher Pr AZs (Guerrero et al., 2005; Peled and Isacoff, 2011). If AZ material is not captured by earlier synapses along the arbor, it would be predicted to accumulate in terminal boutons, potentially allowing these AZs greater access to key components, and subsequently increasing their rate of Pr acquisition. Alternatively, the gradient of Pr along the axon could be due to terminal boutons being slightly older than the rest of the arbor. In summary, our data indicate that heterogeneity in release correlates highly with Ca2+ channel abundance and Ca2+ influx at AZs. Postsynaptically, PSDs apposed to high-releasing AZs display increased GluRIIA abundance and form segregated receptor fields, with GluRIIB forming a ring around a central core of GluRIIA. Release sites accumulate these high Pr markers during a synapse maturation process in which newly formed AZs are consistently low Pr, with AZs gaining signatures of high releasing sites over several days. Finally, mutations that increase or decrease presynaptic activity result in faster or slower rates of PSD maturation, respectively. These data add to our understanding of the molecular and developmental features associated with high versus low Pr AZs. Flies were cultured at 25°C on standard medium. Actively crawling third instar male and female larvae dwelling on top of the food were used for experiments unless otherwise noted. The following strains were used: UAS-myrGCaMP6s, UAS-GCaMP6m-BRPshort, pBid-lexAop-myrGcaMP6s, UAS-myrjRGECO; Elav–GAL4, Mef2–GAL4, UAS-CacGFP (provided by Richard Ordway); UAS-CacTdTomato (provided by Richard Ordway); GluRIIA-RFP inserted onto chromosome III under the control of its endogenous promoter (provided by Stephan Sigrist), GluRIIB-GFP inserted onto chromosome III under the control of its endogenous promoter (provided by Stephan Sigrist); napTS and shaker120b, eag1 (provided by Barry Ganetzky); BRP69 (provided by Stephan Sigrist); BRPdef; rab3rup (provided by Ethan Graf) and 44H10-LexAp65 (provided by Gerald Rubin). syt1 null mutants were generated by crossing syt1N13, an intragenic syt1 deficiency (Littleton et al., 1994), with syt1AD4, which truncates Syt1 before the transmembrane domain (DiAntonio and Schwarz, 1994). brp null mutants were generated by crossing brp69, a truncation mutant, to a genomic deficiency brpdef. 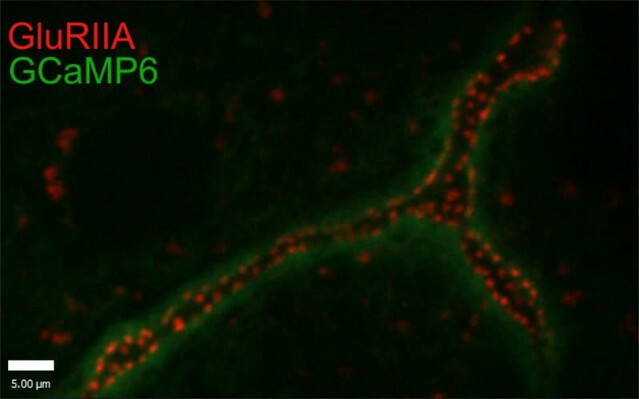 The fluorescent Ca2+ sensor GCaMP6s was tethered to the plasma membrane with an N-terminal myristoylation (myr) sequence. The first 90 amino acids of Src64b, containing a myristoylation target sequence, were subcloned into pBID-UASc with EcoRI and BglII (creating pBID-UASc-myr). GCaMP6s cDNA (Addgene plasmid 40753) was cloned into pBID-UASc-myr with BglII and XbaI. To generate the UAS-GCaMP6m-Brp-short line, GCaMP6m (Addgene plasmid 40754) cDNA and Brp-short (gift from Dr. Tobias Rasse) were PCR amplified and double digested with EcoRI/BglII and BglII/XbaI, respectively. The two cDNA fragments were ligated and the product was used to PCR amplify the fused GCaMP6m-Brp-short cDNA. The PCR product was inserted into the vector backbone pBID-UASc after digestion with EcoRI and XbaI to generate the final plasmid pBID-UASc-GCaMP6m-Brp-short. To create UAS-myrjRGECO, the vector backbone pBID-UASc-myr was digested with BglII and XbaI. jRGECO sequence was amplified from plasmid pGP-CMV-NES-jRGECO1a (gift from Dr. Douglas Kim, Addgene plasmid #61563). The digested backbone and insert were fused according to the Gibson assembly protocol using NEBuilder HighFidelity DNA Assembly Cloning Kit (E5520). To generate pBid-lexAop-myrGcaMP6s, myrGCaMP6s was amplified by PCR and inserted into pBiD-lexAop-DSCP (gift from Brian McCabe) between NotI and XbaI sites. All transgenic Drosophila strains were generated by BestGene. Wandering third instar larvae were dissected in Ca2+-free HL3 solution and fixed in 4% paraformaldehyde for 10 min, washed in PBT (PBS plus 0.1% Triton X-100) and blocked in 5% normal goat serum (NGS) and 5% BSA in PBT for 15 min. Samples were incubated overnight with anti-BRP (NC82, 1:200) from the Developmental Studies Hybridoma Bank (DSHB Cat# NC82, RRID:AB_2314866), washed for 1 hr in PBS and then incubated for 2–3 hr with Alexa Fluor 607-conjugated anti-mouse IgG at 1:1000 (Invitrogen, #A21237, RRID:AB_1500743). Confocal images were obtained on a Zeiss Axio Imager two equipped with a spinning-disk confocal head (CSU-X1; Yokagawa) and ImagEM X2 EM-CCD camera (Hammamatsu). An Olympus LUMFL N 60X objective with a 1.10 NA was used to acquire GCaMP6s imaging data at 7 to 8 Hz. A Zeiss pan-APOCHROMAT 63X objective with 1.40 NA was used for imaging stained or live animals. third instar larvae were dissected in Ca2+-free HL3 containing 20 mM MgCl2. After dissection, preparations were maintained in HL3 with 20 mM MgCl2 and 1.3 mM Ca2+ for 5 min. To stimulate the NMJ, motor nerves were cut close to the ventral ganglion and sucked into a pipette. Single pulses of current were delivered every one second for myr-jRGECO mapping or every three seconds for GCaMP6s mapping with an AMPI Master-8 stimulator using a stimulus strength just above the threshold for evoking EJPs. A 3D image stack was taken before the GCaMP imaging session to generate a full map of GluRIIA or Cac channel distribution. Later, single focal planes were imaged continuously for 4–5 min to collect GCaMP signals. Volocity 3D Image Analysis software (PerkinElmer) was used to analyze images. All images were Gaussian filtered (fine) to reduce noise and a movement-correction algorithm was applied. To enhance identification of myrGCaMP6 flashes, background myrGCaMP fluorescence was subtracted by creating a composite stack of 5–6 images during intervals when no synaptic release occurred. To identify the position of GluRIIA receptors and corresponding Ca2+ events, a 3D stack image of GluRIIA was merged to create a single plane. AZ position was identified using the ‘find spot’ algorithm in Volocity 3.2 software that detects fluorescent peaks. ROIs with identical 5-pixel size (0.138 µm/pixel) were automatically generated by the software from identified GluRIIA spots. All GCaMP flashes were detected using the intensity threshold tool and assigned to specific ROIs based on proximity of their centroids. The time and location of Ca2+ events were imported into Excel or Matlab for further analysis. The number of observed GCaMP events per AZ was divided by the number of delivered stimuli to calculate AZ Pr. Analysis of Cac, BRP, GluRIIA or GluRIIB intensities was performed similarly, identifying AZ fluorescence peaks and defining three pixel square ROIs around each peak to calculate average fluorescence. Average AZ fluorescence intensities of 3-pixel square ROIs was also used for correlation analysis. SIM microscopy was performed on an Applied Precision DeltaVision-OMX BLAZE-3D-Structural Illumination Microscope equipped with 60X, 1.4 NA oil objective and 3 sCMOS cameras. 3D-SIM images were obtained with 125 nm z-steps. Samples were illuminated by three central diffraction orders with 488, 562, and 640 nm lasers. For initial identification of specific NMJs, larvae were imaged in conventional confocal mode using a 20X oil objective. The positions of NMJ were marked and recorded to provide transition between objectives. A ZEISS LSM 800 microscope with Airyscan was also used to image anesthetized animals. Fluorescence was detected by a concentrically-arranged hexagonal detector array consisting of 32 single detector elements. Larvae were anesthetized with SUPRANE (desflurane, USP) from Amerinet Choice (Zhang et al., 2010). Larvae were incubated in a petri dish with a small paper towel containing Suprane for 1–2 min in a fume hood. Anesthetized larvae were positioned ventral side up on a glass slide between spacers made by transparent tape, which prevented extreme compression of the larvae. Different size spacers were required for the various larval stages. Larvae were covered with a thin film of halocarbon oil and then with a cover glass. NMJ synapses on muscle 26 in hemi-segment 2 or three were imaged. After an imaging session, larvae were placed in numbered chambers with food in a 25°C incubator. The same data acquisition settings where used to visualize NMJs at different larval stages. Larvae were imaged with either 6, 24 and 36 hr intervals for one data set (Figure 8A–C), or for 24 hr intervals for the remaining datasets. To keep the size consistent between different time periods, images of the corresponding NMJ area at younger stages were cut (dashed areas in figures) and placed onto a black background. This presentation generated a similar orientation of the different size NMJs for easier comparison for Figure 8, Figure 9 and Figure 8—figure supplement 1. Ionomycin (Sigma Aldrich) was dissolved in ethanol to make a 10 mM stock solution and was stored at 4°C. Ionomycin was used at a working concentration of 200 nM dissolved in HL3 with 1.3 mM Ca2+; this solution was applied to dissected preparations and NMJs were imaged one minute after application. Statistical analysis was performed with GraphPad Prism using one-way ANOVA followed by Dunnett’s Multiple Comparisons test for comparison of samples within an experimental group, or Student’s t-test for comparing two groups. Asterisks denote p values of: *p≤0.05; **p≤0.01; and ***p≤0.001. All histograms and measurements are shown as mean ± SEM. Pearson coefficient of correlation was calculated in GraphPad Prism using the following parameters: - two-tailed P value and 95% confidence interval. Cold Spring Harbor Protocols 2012:pdb.top068577. The Journal of Physiology 367:163–181. The Journal of Neuroscience 19:3023–3032. Annals of the New York Academy of Sciences 635:139–152. The Journal of Neuroscience 37:1910–1924. The Journal of Comparative Neurology 402:197–209. The Journal of Physiology 262:189–214. The Journal of Physiology 189:535–544. The Journal of Physiology 203:689–706. The Journal of Neuroscience 20:4885–4889. Frontiers in Synaptic Neuroscience 8:5. The Journal of Physiology 547:665–689. Frontiers in Cellular Neuroscience 9:29. Journal of Biological Chemistry 278:41099–41108. The Journal of Neuroscience 16:7868–7879. The Journal of Neuroscience 14:3688–3703. Molecular and Cellular Neuroscience 47:19–27. Current Opinion in Neurobiology 8:351–356. Journal of Visualized Experiments : JoVE, 10.3791/2249. Thank you for choosing to send your work, "Examining molecular determinants underlying heterogeneity of synaptic release probability using optical quantal imaging", for consideration at eLife. Your submission has been assessed by a Senior Editor in consultation with a member of the Board of Reviewing Editors (Hugo Bellen). Although the work is of interest, the editors felt more was needed to reveal enough new insight. However, they believe that if additional experiments are carried out and can answer specific questions, the manuscript could be suitable for eLife given the high quality of the data and the contribution to the field. This means that the work has potential. By rejecting the paper at this point you are free to move on to another journal at this time. On the other hand, if you feel the requested expeiments would substantially improve the manuscript and you wish to do these experiments (or have already done them), eLife would welcome a resubmission of this work. If you decide to resubmit to eLife, some comments should be addressed in the submission. These particular comments are indicated in the reviews with quotation marks ("…"). In this study, Akbergenova et al. seek to determine how the heterogeneity in release probability (Pr) is established across active zones at the Drosophila NMJ. Building from previous work this lab has pioneered in imaging presynaptic active zones (AZs) and the postsynaptic response from imaging single quantal release events, the authors now combine this optical quantal imaging with SIM microscopy and newly developed optical probes to provide compelling evidence for four main findings: First, Pr is a stable feature of each active zone and is highly correlated with the intensity of the BRP scaffold and calcium channel Cac at AZs. Second, Pr heterogeneity persists in Synaptotagmin mutants, consistent with AZ structures playing a primary role in determining Pr heterogeneity. Third, the subset of high Pr AZs acquire a change in the postsynaptic receptor field, including an enrichment in GluRIIA-containing receptors centrally opposed to AZs is observed, with GluRIIB-containing receptors located on the periphery. Finally, the authors undertake a challenging developmental analysis to provide evidence that the age of an active zone predicts Pr, with the oldest AZs acquiring the most BRP/Cac material and hence exhibiting the highest Pr. Overall, this is a technically impressive study that reveals correlations between functional and structural features of AZs and PSDs at unprecedented resolution. The authors findings are consistent with work from many other labs identifying a positive correlation between increasing size, intensity, and/or abundance of AZ components with enhanced release probability. Further, the authors have provided very good evidence for biomarkers of high release probability at individual AZs that will be important for many researchers in the field, in which high Pr AZs are defined by high intensities/size of BRP, Cac presynaptically and acquire the GluRIIA center/GluRIIB periphery structure. Although this central finding, that large active zones with high levels of calcium channels are highly correlated with high Pr was known or strongly suggested from previous studies, the previous work did not put together functional and structural analyses together to demonstrate these properties at such high resolution. Further, it is particularly impressive that the authors go on to developmentally follow AZs as they mature, and provide evidence for what leads to AZs with high Pr, which appears to be essentially the age of the AZ. These are all important contributions. However, I have three major criticisms on both technical and biological importance that need to be addressed. The authors frame this study as if there is an open question about whether AZs components are allocated heterogeneously and whether this has a significant impact on Pr heterogeneity. It is not a major question or controversy that AZs with higher levels of calcium channels (and other associated machinery) will have a strong influence on Pr. Studies at the Calyx of Held have demonstrated that calcium channels respond consistently with each action potential at active zones and obviously more channels will give more calcium influx, increasing release probability (see Sheng et al., 2012; Nakamura et al., 2015; Schneggenburger et al., 2012; Borst and Sakmann, 1996; Meinrenken et al., 2012; Sudhof, 2012, etc). Thus, “I think the authors should clearly lay this out in the Introduction and use their approach here to test the relative importance of AZ size/abundance vs other factors (synaptic vesicle proteins, modifications to AZ machinery) in determining Pr heterogeneity”. The technical rigor is what really stands out about this study, and though not particularly surprising, the validation of what many in the field have long suspected is still important. An important addition would be for the authors to estimate how much of the Pr heterogeneity is conferred by size/abundance of BRP/Cac at AZs (see below). 1) Framing of manuscript: The authors frame this study as if there was little evidence one way or the other to indicate the likely mechanisms that impose Pr release heterogeneity at synapses. But as the authors point to towards the end the Discussion and in other areas of the manuscript, there is a large body of work that has already established that active zone size (and/or levels of AZ components at individual AZs) plays a major role in release probability and heterogeneity at synapses (see Holderith et al., 2012; Murthy et al., 2001; Matz et al., 2012; Ariel et al., 2012; Murthy et al., 1997; Rosenmund et al., 1993; Graf et al., 2009; Graf et al., 2012; Marrus and DiAntonio, 2004; Matkovic T et al., 2013). Further, it is well established that BRP size/intensity, as well as Cac intensity, varies considerably across AZs at the Drosophila NMJ; many studies have shown and quantified staining of BRP/Cac and other components at fly NMJs and shown a wide variation in size/intensity (Guerrero et al., 2005; Ehmann et al., 2014; Graf et. al, 2009; Paul et al., 2015; Peled and Isakoff, 2011). Several studies have also demonstrated that synaptic strength is positively correlated with such features (Wagh et al., 2006; Kittel et al., 2006; Kittel and Heckmann, 2016; Weyhersmuller et al., 2011). In addition to AZs, studies using Flash Photolysis at the Calyx of Held have shown that synaptic vesicles release with different intrinsic rates, independently of proximity to calcium sources (Wolfel et al., 2007; Schneggenburger et al., 2002). There is therefore a rich literature in which to frame the study as an investigation of the relative importance of AZ size/intensity/abundance vs other factors. "Thus, the Introduction needs to be significantly revised to lay out from the outset what is known and suspected and give proper credit in setting up the motivation for this study." I would strongly encourage and push the authors to frame the manuscript as an effort to define the relative contributions and importance of 1) AZ size/abundance of AZ material; 2) functional modifications (phosphorylation, etc); and 3) synaptic vesicle pools in determining the heterogeneity of Pr at synapses. The authors find a strong correlation between BRP/Cac intensity and Pr, which is not particularly surprising. But can the authors take advantage of their quantitative approach and seek to provide estimates of the relative importance of factors beyond AZ/Cac abundance in determining Pr heterogeneity? Clearly there is not a perfect correlation with Pr and Cac intensity, so can the authors say something about the importance of other factors in contributing to Pr heterogeneity? 2) Investigate Pr heterogeneity when AZ size/number is altered: The authors provide compelling evidence that Pr heterogeneity persists in synaptotagmin mutants, indicating that heterogeneity is not absolutely dependent on a key determinant of Pr from synaptic vesicles. In this case, is Pr more strongly correlated with BRP/Cac abundance? "It would be a great addition to show to what extent Pr heterogeneity persists in a converse experiment – when AZ size is greatly enlarged (including BRP/Cac abundance), while AZ number/density is reduced in rab3 mutants (Graf et al., 2009). This would be of major interest and would nicely complement their study on syt mutants while serving to address the question on the relative importance of AZ size/abundance vs. synaptic vesicle/functional modifications in determining Pr heterogeneity. " 3) Measuring calcium influx at AZs: The authors target the GCaMP6 reporter to active zones by fusing it to the BRPs sequence and claim that they are measuring differential calcium influx at each AZ (Figure 5 and 6). However, work from many groups have suggested that even the newest GCaMP reporters are too slow to capture the rapid calcium transients at AZ nanodomains, and instead the total calcium influx from all AZs equilibrates before GCaMP can capture the local change in concentration (see work from David DiGrigorio, Graeme Davis, Greg Macleod, etc). This is thought to be true for single action potential events and is even more of a concern using the 10Hz/5 sec paradigm by the authors. Hence, a very likely alternative explanation for the results shown in Figures 5 and 6 is that a similar concentration of calcium is experienced at each GCaMP-BRP puncta following the 10Hz stimulation, and that the abundance of the GCaMP reporter itself varies according to BRP/AZ size. Thus, the authors are simply reporting that GCaMP-BRP abundance correlates with BRP abundance at each AZ. "The authors can easily show this by immunostaining their GCamp-BRP NMJ with anti-GFP and correlating the size/intensity with anti-BRP. " Indeed, such as analysis was actually performed using a similar reagent published recently (BRPs-GCaMP6-mCherry; Kiragasi et al., 2017). The authors may wish to cite this study and/or even use this reagent to perform ratiometric calcium imaging with the mCherry tag, which may help to control for heterogeneity in abundance of the GCaMP reporter at AZs. I don't think this is major point that detracts from the overall study, as higher BRP/Cac size/abundance almost certainly correlates with elevated calcium influx at individual active zones. But this section needs to be thoroughly revised to take into account this major possibility and the many caveats that the authors need to consider in their attempt to measure and interpret calcium influx at single active zones. This study used high resolution Calcium imaging to determine the components that contribute to or correlate with the heterogeneous distribution of AZ release probability Pr. Although most of the results confirm what is already known about the AZ Pr and therefore not surprising, providing direct measurement at such spatial and temporal resolution advances our understanding of the AZ Pr. The first half of the paper showed that the Pr heterogeneity is correlated with Calcium channel abundance and Ca2+ influx. The second half of the paper showed that the birth order of AZs determines the clustering of GluRII and Pr. It remains unclear whether the accumulation of presynaptic AZ material is determined by birth order and whether the coupling of pre- and post-synaptic material accumulation during development requires neurotransmission. 1) Correlation between pre- and post-synaptic calcium events. In evoked events, presynaptic calcium influx at the AZ is required for synaptic vesicle fusion, and AZ calcium transients are necessary (but not sufficient) for EPSP, therefore, one would expect a stronger correlation between pre- and postsynaptic calcium events (determined in Figure 6) than that between calcium channel localization/abundance and postsynaptic calcium events (Figure 4). However, the authors observed almost opposite results where postsynaptic calcium events seem to correlate better with channel localization/abundance (r=0.62 Figure 4B) than with calcium influx (r=0.56, Figure 6B). The authors didn't offer any interpretation. The conclusion that "Ca2+ influx is the key factor that regulates evoked release at individual AZs" is not fully supported, as the results support a "correlation" between Ca2+ channel abundance/Ca2+ influx and Pr. The actual "regulator", which determines the presynaptic Ca2+ channel abundance and local Ca2+ influx, still remains unknown. Also, in these experiments, it is unclear how the transgenes are expressed separately in the neuron and the muscle. The methods listed both transgenes, UAS-Cac-tdTomato, UAS-GCaMP, but no indication of GAL4 drivers used to express both either together or separately. 2) Developmental acquisition of Pr property. The finding of developmental clustering of GluRII is fascinating. If the birth order of AZs determines the level of maturation and the accumulation of GluRII, then the birth order also determines Pr and its heterogeneity. "It needs to be determined whether the presynaptic terminal influences/contributes to the postsynaptic GluRII clustering. The authors indicated feasibility issues with Pr map, however, measuring developmental/birth order clustering of Cac should be feasible, since Cac abundance is correlated with Pr. In addition, the developmental clustering of Calcium channels and GluRII should be done in syt mutant background to determine the effect of transmission (evoked or spontaneous)." 3) NMJ specificity. Majority of the analysis focuses on the NMJ formed only by MN4-Ib onto muscle 4 at one time point (early L3 larvae). It will be valuable to at least include another NMJ, and include a different development stage (e.g., late L3 larve) for the Pr map (like Figure 1A-C). The authors build on previous work performed by them and others to understand the variability in release probability (Pr) seen at different active zones (AZ) at the Drosophila NMJ. They use some well-characterized and new genetic tools to measure calcium influx and localization of pre and post-synaptic machinery. Overall, they find Pr to be correlated with (a) BRP levels, (b) calcium channels (Cacophony), (c)Presynaptic calcium influx and d)GlurIIA levels at the PSD (Post synaptic density). They also determine that Synaptotagmin does not influence the heterogeneity of Pr at different AZs. Finally, they do in-vivo imaging to determine that "birth order" of AZ seems to correlate with Pr such that synapses that were formed earlier had higher Pr. Technically, the experiments are done very well. As such, a very nice descriptive analysis of various aspects that control Pr is presented. The authors have failed to adequately test or describe the biological significance of the finding. Additionally, it is not clear how the findings presented significantly extend the body of knowledge that is present on how Pr is set at the Drosophila NMJ or elsewhere. For instance, the variability of Pr at different AZ at Muscle 4 has been demonstrated before and this has been correlated with levels of BRP (Peled, 2011). Levels of BRP is also correlated with the increased accumulation of Calcium channels (Fouquet, 2009) and this would presumably lead to higher calcium influx within these active zones. Furthermore, higher BRP levels are also correlated with higher GluRIIA levels at the PSD (Petzoldt, 2014). If there is some finding that does diverge from previous work, the authors should make a stronger point to highlight that fact. Further genetic analysis could be used to delineate exactly how the different components (BRP, Cacophony, GlurII etc.) may affect Pr and. whether these proteins play independent or dependent roles in controlling the heterogeneity of Pr across AZ. "The authors could investigate how the various BRP alleles affect the Pr. The BRPnude allele does not seem to affect vesicle release but does affect synaptic depression. A conditional reversible knockdown of BRP has been documented (Nagarkar-Jaiswall et al., 2015). This allows one to control Brp levels." "Does the reduction in Cacophony levels by RNAi or mutants change the heterogeneity of Pr? would it be possible to use a calcium channel mutant with reduced activity to specifically differentiate whether the presence of the calcium channel is enough to define the high Pr or the influx of calcium is needed?" Similar analysis could be done with GluRII mutants or alleles such as GluRIIAE783A. Furthermore, how does this developmentally controlled heterogeneity compare to synaptic plasticity? Are the identified high Pr sites the most prone to synaptic depression? Are the low Pr sites preferentially recruited to induce synaptic potentiation? In the last section of the Results section, the authors correlate the number of mature AZs at the larval NMJ seen by in-vivo imaging with the number of high Pr AZs observed in the previous Pr mapping. They must avoid concluding that because both numbers are similar (14.7% and 10% respectively), it supports their hypothesis about the link between AZ maturation and high Pr.These are very different experiments (in-vivo imaging vs larval preparations) and are also conducted at different NMJs (Muscle 4 vs Muscle 26). The authors should follow up their in vivo imaging with calcium imaging on larval preps to show that the mature AZ do in fact have high Pr. We appreciate the reviewers’ comments on our manuscript and suggestions for improvement. All three reviewers were positive about the study and suggested several avenues for improving the presentation and extending the science, as well as refocusing how we presented the data. We have addressed their concerns in a point-by-point response below. In addition, we have added a host of new data and figures to extend our initial findings as suggested by the reviewers. Reviewer 1 described the study as “a technically impressive study that reveals correlations between functional and structural features of AZs and PSDs at unprecedented resolution”. The reviewer requested three major clarifications and some additional minor comments we have now addressed as described below. In our revised manuscript, we have focused our findings in the context of what is known in the field as suggested by the reviewer. We indicate the well-described previous links in the field to Ca2+ channels and Ca2+ influx in relation to synapse strength. We have reframed our data presentation as the reviewer suggests to lay out the relative importance of the AZ components versus other factors. In addition, we have shifted the last half of the study to investigate how activity alters PSD maturation during development to provide new insights that further separate our study from prior work. Investigate Pr heterogeneity when AZ size/number is altered: "It would be a great addition to show to what extent Pr heterogeneity persists in a converse experiment – when AZ size is greatly enlarged (including BRP/Cac abundance), while AZ number/density is reduced in rab3 mutants (Graf et al., 2009). This would be of major interest and would nicely complement their study on syt mutants while serving to address the question on the relative importance of AZ size/abundance vs. synaptic vesicle/functional modifications in determining Pr heterogeneity. " As requested by the reviewer, we completed a new set of experiments in the rab3 mutant and added new data and figures on this topic. Prior work with rab3 (Peled and Isacoff, 2011) had been done with optical quantal imaging to examine Pr in the mutant, revealing that the majority of sites have low Pr, with a smaller population of large release sites with much higher Pr. We observed a similar phenotype in our study and were able to extend the analysis by using the redistribution of Pr seen in the rab3 NMJ as atool to examine the activity-dependence of postsynaptic glutamate receptor field maturation on presynaptic activity using intravital imaging across development (new Figure 10 and Figure 10—figure supplement 1). While prior studies of rab3 mutants examined the third instar stage, we used sequential intravital imaging throughout the whole developmental window beginning in first instar larvae to determine how the NMJ develops with only a few large AZs containing Cac and BRP, while the rest of the AZs lack these components. We observed that glutamate receptor fields apposing BRP-enriched sites developed into a more mature state than PSDs apposing sites lacking BRP and Cac. This observation suggests that PSD maturation depends on either presynaptic components or presynaptic release at the level of single release sites. Coupled with new data we provide on other mutants that enhance or decrease neuronal activity, our findings indicate that the level of synaptic activity at single AZs is a key factor in controlling the rate of postsynaptic maturation of the glutamate receptor field. As the reviewer correctly points out, differences in BRP levels at individual AZs may affect our measurement. Although the use of ratiometric GCaMP-mcherry sensors for this work would be great, it is not feasible for our Pr mapping as we need the red channel for postsynaptic Ca2+ measurements to assign synaptic vesicle fusion events to individual AZs. As such, we have reworked this section to highlight this important caveat noted by the reviewer. We note that the GCaMP-BRP sensor data is used to support our conclusions drawn from the Cac localization studies and Pr mapping. In addition, we experimentally addressed the reviewers comment as well. The nc82 antibody recognizes an epitope at the C-terminus of BRP and thus also recognizes BRPshort. Therefore, we were unable to stain for endogenous BRP in this line without also labeling GCaMP-BRPshort. We therefore approached this question using a different method; we applied the Ca2+ ionophore ionomycin to uniformly elevate intracellular Ca2+ throughout the presynaptic terminal. We then measured the heterogeneity in fluorescence from GCaMP-BRPshort before applying ionomycin (baseline fluorescence), during 10 Hz stimulation, and after ionomycin application. In the presence of ionomycin, differences in fluorescence signals between AZs should be entirely due to heterogeneity in sensor abundance. We observed a rightward shift in the GCaMP-BRPshort intensity distribution among AZs upon ionomycin application compared to 10 Hz stimulation (Figure 5—figure supplement 1A, B), indicating that detection of Ca2+ by GCaMP-BRPshort fluorescence during 10 Hz stimulation is not limited by sensor abundance. Furthermore, we observed a significant difference in the shape of the distribution during 10 Hz stimulation compared to both before stimulation and after ionomycin. The distribution of fluorescence intensities is narrower both at rest and upon ionomycin application; these two distributions should primarily reflect sensor distribution. In contrast, the distribution of GCaMPBRPshort fluorescence upon 10 Hz stimulation is wider, indicating that the sensor is reporting local changes in Ca2+ influx and not just sensor distribution (Figure 5—figure supplement 1C, D). Thus, although GCaMP-BRPshort abundance is likely to contribute to the levels of Ca2+ influx detected, these results are consistent with heterogeneity in Ca2+ influx across individual AZs. We have modified the text to clearly explain this caveat and have added a new supplemental figure for the ionomycin experiment (Figure 5—figure supplement 1). We also added another experimental approach to further strengthen the connection between Pr and Ca2+ influx. We reasoned that if Ca2+ influx at AZs, and not just Cac abundance, is a driving factor in release heterogeneity, then specifically reducing the conductance of Cac should reduce Pr across the entire range of release, effectively shifting the distribution towards lower Pr but maintaining the overall shape of the distribution. As such, we performed Pr mapping in the cacNT27 mutant, which has a point mutation in the S4 voltage sensor that reduces Ca2+ influx and observed the expected change. These data provide functional validation that Ca2+ levels are important for overall Pr and are not simply correlated (not that this is a controversial assertion given the large number of studies demonstrating this point). Reviewer 2 found the developmental analysis fascinating and suggested some valuable additional experiments and some clarifying modifications to the text. 1a) Correlation between pre- and post-synaptic calcium events. In evoked events, presynaptic calcium influx at the AZ is required for synaptic vesicle fusion, and AZ calcium transients are necessary (but not sufficient) for EPSP, therefore, one would expect a stronger correlation between pre- and postsynaptic calcium events (determined in Figure 6) than that between calcium channel localization/abundance and postsynaptic calcium events (Figure 4). However, the authors observed almost opposite results where postsynaptic calcium events seem to correlate better with channel localization/abundance (r=0.62 Figure 4B) than with calcium influx (r=0.56, Figure 6B). The authors didn't offer any interpretation. The results represent correlations over a very large number of AZs across multiple animals. Although it is unclear why the correlation with Ca2+ influx is slightly lower than with Ca2+ channel density, it may be reflective of the fact that we have to measure Ca2+ influx during a short train of action potentials rather than with the single stimuli we use to measure Pr. As such, the Ca2+ influx measurements are not direct assays for single action potential Ca2+ transients, and certainly reflect summation of signals over the short train. However, they do support the model that AZs with higher Ca2+ channel density and overall higher Ca2+ influx are likely to be higher Pr synapses. As described in reviewer 1 comment 3, we also added new functional data on the effect of a Cac mutant and its ability to support release as a mechanism to strengthen the model. 1b) Clarifying correlation vs. causation in release. The conclusion that "Ca2+ influx is the key factor that regulates evoked release at individual AZs" is not fully supported, as the results support a "correlation" between Ca2+ channel abundance/Ca2+ influx and Pr. We agree with the reviewer that causation cannot be inferred directly from the correlation between Cac abundance/Ca2+ influx and Pr. For example, Ca2+ influx could vary between AZs without serving as the limiting reagent for vesicle fusion. In response to this concern, we performed an additional genetic manipulation to test whether Ca2+ influx through presynaptic Ca2+ channels, independent of the structural presence of the channel, is truly a causative factor in evoked release at Drosophila NMJs. When we mapped release probability in cacNT27 mutants, which have lower conductance due to a point mutation in the S4 voltage sensor, we observed a significant downward shift in the distribution of Pr at the NMJ (Figure 6—figure supplement 1). This suggests that amount of Ca2+ influx through Ca2+ channels, rather than the mere presence of the channels, directly effects release at AZs across the release spectrum. 1c) The regulator of presynaptic calcium channel abundance. The actual "regulator", which determines the presynaptic Ca2+ channel abundance and local Ca2+ influx, still remains unknown. Through our developmental analysis of AZ maturation using intravital imaging, we have shown that one key primary regulator of presynaptic Ca2+ channel abundance is age. Ca2+ channels accumulate at AZs throughout their maturation process. We demonstrated that AZs add Cac throughout their development by following Cac-GFP and GluRIIA-RFP over time. Unlike the Cac-GFP area, the GluRIIA-RFP field is large enough to be reliably resolved by light microscopy, and we observed that the size and intensity of the GluRIIA field increases over time as AZs mature. Moreover, we saw a strong correlation between Cac-GFP intensity and GluRIIA intensity, suggesting these two components are tightly coupled during synapse maturation. Based on this information, we suggest that Cac abundance at AZs increases during maturation and that AZ age is a major factor in determining AZ Ca2+ channel abundance. There are likely to be many interesting mechanisms further regulating the rate of Ca2+ channel accumulation and persistence at AZs, as well as the regulation of Ca2+ channel gating at individual AZs, and these are topics of interest moving forward. We thank this reviewer for pointing out the lack of clarity in our methods of transgene expression. In this study, all presynaptically driven transgenes (UAS-Cac-tdTomato, UAS-CacGFP, and UAS-GCaMP-BRPshort) were expressed using the pan-neuronal driver elav-GAL4. Postsynaptically, UAS-myr-GCaMP6s was driven with the muscle driver mef2-GAL4 when coexpressed with GluRIIA-RFP, which was inserted on chromosome III and driven using its endogenous promoter. Myr-GCamP6s was driven using the LexA/LexOP system in muscle when combined with GluRIIA-RFP and GluRIIB-GFP which were both inserted on chromosome III and driven using their endogenous promoters. This has been clarified throughout the text. Developmental acquisition of Pr property. The finding of developmental clustering of GluRII is fascinating. If the birth order of AZs determines the level of maturation and the accumulation of GluRII, then the birth order also determines Pr and its heterogeneity… It needs to be determined whether the presynaptic terminal influences/contributes to the postsynaptic GluRII clustering. The authors indicated feasibility issues with Pr map, however, measuring developmental/birth order clustering of Cac should be feasible, since Cac abundance is correlated with Pr. In addition, the developmental clustering of Calcium channels and GluRII should be done in syt mutant background to determine the effect of transmission (evoked or spontaneous)." This was an excellent set of suggestions, and we performed an extensive number of experiments to address these questions; this new addition enhanced the novelty of this work and we are grateful to the reviewer for contributing these ideas. We addressed the question of whether differences in presynaptic activity levels can alter the maturation rate of synapses at the level of individual AZs. Instead of monitoring Cac-GFP and GluRIIA-RFP over time like the reviewer suggested, we chose to perform these experiments using GluRIIA-RFP and GluRIIB-GFP for two reasons. First, GluRIIA and GluRIIB co-labeling allows us to identify PSDs that display receptor subtype segregation, which is a useful marker for the progression of PSDs through maturation. Second, Cac-GFP puncta are smaller than the resolution limit of conventional light microscopy, and so all quantification through the cuticle would rely on comparisons in Cac puncta intensity that could be affected by bleaching and by varying cuticle thickness. We began by measuring the rate of PSD growth (24-hour fold-increase in GluRIIB area) and maturation (percent of PSDs displaying GluRIIA/GluRIIB segregation) in BRP69/def mutants that (1) alter presynaptic structure and (2) decrease release by reducing Cac abundance at AZs. In this mutant we observed a significant reduction in both PSD growth and ring formation. In syt1null, and napTS mutants that reduce presynaptic release without structural changes to the AZ, we also observed a significant reduction in postsynaptic maturation rate (Figure 10). In the shaker, eag double mutant with increased presynaptic excitability, we observed a significantly increased rate of GluRIIB field size increase when compared to control, and a significant increase in GluRIIB rings at the early second instar stage (Figure 10). Finally, we used the rab3 null mutant to investigate whether differences in PSD growth and maturation rate could occur between AZs containing BRP and Cac versus neighboring AZs within the same NMJ that are deficient in these components. In the first instar stage when AZs are roughly age matched, we saw that release sites enriched in presynaptic components had developed large and mature PSDs in stark comparison with un-enriched AZs, whose PSDs were underdeveloped (Figure 10, supplementary figure 1). Overall, these results strongly suggest that presynaptic activity drives postsynaptic maturation rate at an AZ-specific level and opens many exciting questions for future work. NMJ specificity. Majority of the analysis focuses on the NMJ formed only by MN4-Ib onto muscle 4 at one time point (early L3 larvae). It will be valuable to at least include another NMJ, and include a different development stage (eg, late L3 larve) for the Pr map (like Figure 1A-C). 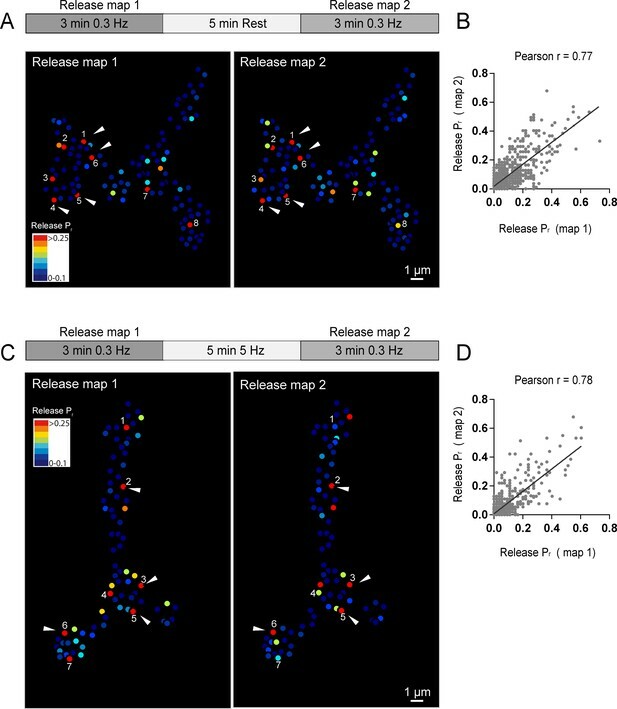 We agree that Prmapping at a different developmental stage and another NMJ are valuable additions to this study, even beyond their ability to determine how generalizable our observations of release heterogeneity are across synapses and across developmental stages. Mapping release at muscle 26 serves to connect the work we have done building correlations between release and synapse component density in muscle 4 with the work performed following AZ maturation over development at muscle 26. We were pleased to see that when we mapped release at muscle 26 in the third instar stage, the distribution in Prwas indistinguishable from the distribution seen at the NMJ on muscle 4 (Figure 9—figure supplement 1). This suggests that our findings in these two NMJs are indeed comparable, and that Pr heterogeneity is not specific to muscle 4. Mapping release in the second instar provides another way to test our model that AZ age and developmental maturation are key determinants of Pr heterogeneity during NMJ development. Based on our observation that the number of AZs roughly doubles every 24 hours of development, and that AZs are born weak and undergo a multi-day maturation process where they develop high Pr, we would expect the second instar NMJ to show a shift in Pr distribution when compared to the third instar NMJ. Specifically, we would expect a lower percentage of low Pr sites in second instar stage (as the number of AZs will double over the next 24 hours and the newly added AZs will be low Pr). Indeed, when we mapped Pr in the second instar stage, we observed the expected shift in the distribution ((Figure 9—figure supplement 1)), providing support for the model that developmental maturation and new AZ addition over time generates heterogeneity at the NMJ. Reviewer 3 indicated the manuscript was technically done very well but wanted clarification on the biological significance of the findings and the novelty of the current data. We thank this reviewer for pointing out the lack of discussion on the novelty of this work, and we have altered the text significantly to further contextualize these results. Though it has already been shown that Pr heterogeneity exists across the NMJ (Peled 2011, Melom 2013) and that Pr correlates with levels of BRP (Reddy-Alla et al., 2017, Muhammad et al., 2015, Peled et al., 2014), the work presented here extends this body of knowledge in multiple important ways. Combining our green Ca2+ sensor with GluRIIA-RFP to mark individual release sites has allowed us to provide a higher resolution view of the correlation between single AZ evoked release and BRP, Cac, and GluRIIA abundance. GluRIIA-RFP also allowed us to employ superresolution structured illumination microscopy after quantal imaging to confirm that high releasing sites correspond to single AZs. This increase in resolution is essential for understanding release heterogeneity at the NMJ, where single BRP T-bars are smaller than the resolution of conventional light microscopy and can be closely clustered. We have assessed the role of local synaptic vesicle pools in determining local release heterogeneity. Though it has been established that certain synaptic vesicle components (like Syt1) are dominant factors in determining Pr at synapses, the role of local synaptic vesicle pools in determining release heterogeneity across AZs of the NMJ has not been explored. By showing that heterogeneity in release is retained in syt1 null mutants, and is stable during extensive synaptic vesicle cycling, the study indicates that AZ-specific, differentially fusogenic synaptic vesicle populations are unlikely to underlie the heterogeneity in release observed at the NMJ. We have shown that AZ maturation throughout the three stages of larval development plays a dominant role in generating the extreme release heterogeneity that we and other labs have observed in the third instar larval stage. The Sigrist lab has previously demonstrated that AZs gain presynaptic and postsynaptic components over time, generating the hypothesis that AZ aging process may lead to increasing AZ Pr. However, to demonstrate that the heterogeneity observed at the third instar stage results largely from AZ birth date, we needed to extend this intravital imaging of individual release sites through a longer time period starting much earlier in development to show that the heterogeneity in developmental birth order is a major source of heterogeneity in AZ release probability at the third instar stage. This long-term developmental perspective, extending from early first to third instar stages, provides an important developmental picture of how release heterogeneity arises. Since the field typically uses the third instar NMJ as a model to study presynaptic release, understanding how functional release heterogeneity seen at the third instar NMJ is established from a molecular and developmental perspective provides valuable information about this common model synapse. We have included additional experiments to show that postsynaptic maturation rate is activity-dependent and can occur at an active zone-specific level (this is discussed below). To our knowledge, this has not been previously demonstrated at the NMJ. Overall, these results provide a more developmentally complete and technically higher resolution understanding of how release heterogeneity at the NMJ arises during development. 1b) Furthering biological significance through more genetic analysis. “Further genetic analysis could be used to delineate exactly how the different components (BRP, Cacophony, GlurII etc.) may affect Pr and. whether these proteins play independent or dependent roles in controlling the heterogeneity of Pr across AZ… The authors could investigate how the various BRP alleles affect the Pr.The BRPnude allele does not seem to affect vesicle release but does affect synaptic depression. A conditional reversible knockdown of BRP has been documented (Nagarkar-Jaiswall et al., 2015). This allows one to control Brp levels." This reviewer encouraged us to move beyond building correlations between AZ components and release probability in wildtype animals and to begin using genetic manipulations to further understand the generation of heterogeneous Pr at the NMJ. Since we have shown that AZ age is a strong contributor to the abundance of pre- and postsynaptic proteins that our lab and others have shown to correlate with Pr heterogeneity at the NMJ, we added an entire set of new experiments to investigate what parameters affect age-dependency of Pr. First, we established confidence in the age-dependency of Pr using two new experiments; we showed that all new active zones (under 24 hours old) are low Pr (Figure 9F, G). Second, we mapped Pr in the second instar stage and showed that, in line with what our model predicts, the heterogeneity in release in the second instar is shifted towards higher releasing sites, with a reduction in low-releasing sites (Figure 9—figure supplement 1). After further documenting the age-dependence of Pr, we addressed the concern that further genetic manipulations could be used to determine how overall component accumulation during development could shape Pr distribution by assaying whether mutants that alter presynaptic activity can influence synapse maturation rate (Figure 10). We measured the rate of PSD growth (24-hour fold-increase in GluRIIB area) and GluRIIA/B segregation in mutants with altered presynaptic activity. In the BRP69/def, syt1null, and napTS mutants with decreased presynaptic release, we observed a significant reduction in postsynaptic maturation rate and a significant reduction in GluRIIA/IIB rings (Figure 10). In the shaker, eag double mutant with increased presynaptic excitability, we observed a significantly increased rate of GluRIIB field size increase compared to control, and a significant increase in GluRIIB rings at the early second instar stage (Figure 10). Finally, we used the rab3 null mutant to investigate whether differences in PSD growth and maturation rate could be seen between AZs containing BRP and Cac vs. neighboring AZs within the same NMJ that are deficient in these components. In the first instar stage when AZs are roughly age matched, we observed that release sites enriched in presynaptic components had developed large and mature PSDs in stark comparison with un-enriched AZs, whose PSDs were underdeveloped (Figure 10—figure supplement 1). Overall, these results add valuable new information to the study; we have shown that not only is the heterogeneity in AZ Pr explained by differences in AZ component density that reflect differences in AZ age, but we have also shown that this dependence on age can be influenced by changes in presynaptic activity. 1c) Functional demonstration that calcium influx determines Pr. “Does the reduction in Cacophony levels by RNAi or mutants change the heterogeneity of Pr? would it be possible to use a calcium channel mutant with reduced activity to specifically differentiate whether the presence of the calcium channel is enough to define the high Pr or the influx of calcium is needed?" This is an excellent suggestion. As another approach to test whether the level of Ca2+ influx rather than the structural presence of the Ca2+ channel is responsible for determining Pr, we generated Pr maps in the cacNT27 mutant using dual color quantal imaging, with GluRIIA-RFP and myrGCamP6s expressed postsynaptically in the muscle. CacNT27 channels have reduced Ca2+ conductance due to a point mutation in the Cac S4 voltage sensor (Rieckhof et al. 2003). We observed that cacNT27 results in a global decrease in Pr across AZs; WT evoked Pr ranged from 0 to 0.73 with an average of 0.073, while CacNT2 Pr ranged from 0 to 0.47 with a significantly lower average of 0.049 (Figure 6—figure supplement 1). In this mutant, the entire Pr distribution was shifted towards low Pr when compared to controls, and the resulting NMJ was almost entirely populated with low-releasing AZs. This result strongly suggests that the levels of Ca2+ influx through Cac channels, and not the physical presence of the channels, is a primary determinant of Pr at AZs. This is a compelling question, and the Drosophila NMJ provides an excellent model system to dissect the short-term plasticity at low vs. high Pr sites. These questions have been previously addressed by Peled and Isacoff (2011); here, the authors demonstrated that high releasing AZs tend to depress during paired pulse stimulation, while lower releasing AZs facilitate. Thus, the developmentally generated heterogeneity in Pr across AZs results in a population of AZs with distinct short-term plasticity properties. We have included a description of this result in the text. 1e) In the last section of the Results section, the authors correlate the number of mature AZs at the larval NMJ seen by in-vivo imaging with the number of high Pr AZs observed in the previous Pr mapping. They must avoid concluding that because both numbers are similar (14.7% and 10% respectively), it supports their hypothesis about the link between AZ maturation and high Pr. These are very different experiments (in-vivo imaging vs. larval preparations) and are also conducted at different NMJs (Muscle 4 vs. Muscle 26). The authors should follow up their in-vivo imaging with calcium imaging on larval preps to show that the mature AZ do in fact have high Pr. This is an excellent suggestion, and we have altered the text and performed two additional experiments to address this point. First, as the reviewer pointed out, it is not ideal to compare release distributions at muscle 4 versus muscle 26 without directly demonstrating that these two NMJs have a similar distribution of Pr. To address this issue, we mapped release at muscle 26 using the same methods that were used to map release in our initial experiments at muscle 4. When we compared the release distributions at the two NMJs, we saw that the distributions were not significantly different (Figure 9—figure supplement 1). Second, we followed the suggestion of this reviewer to directly assess whether AZ age corresponds to Pr by mapping Pr after determining the developmental age of AZs using intravital imaging. We followed PSDs in animals expressing GluRIIA-RFP, GluRIIB-GFP, and myr-GCaMP for 24 hours using in vivo imaging, and then dissected the animal and mapped Pr (Figure 9F). We observed that PSDs that appeared on the second day of imaging (less than 24 hours old) were consistently associated with very low-Pr AZs. The mean Prof newly-formed AZs was 0.035, and the Pr for AZs older than 24 hours was 0.15 (Figure 9G). This result supports a model in which a vast majority of AZs are born weak, and higher Pr takes more than 24 hours to develop. This work was supported by NIH grant MH104536 to JTL. KLC was supported in part by NIH pre-doctoral training grant T32GM007287. We thank the Bloomington Drosophila Stock Center (NIH P40OD018537), the Developmental Studies Hybridoma Bank, Richard Ordway (Penn State University), Ethan Graf (Amherst University), Barry Ganetzky (University of Wisconsin, Madison), Gerald Rubin (Janelia Research Campus) and Stephan Sigrist (Freie Univesitat Berlin) for providing Drosophila strains, the Microscopy Facility at the Koch Institute for Integrative Cancer Research at MIT for access to the SIM microscope, Eliza Vasile for help with SIM image acquisition, and members of the Littleton lab for helpful discussions and comments on the manuscript.